Mantra of the Medicine Buddha | Sana Ako si Ricky Lee! 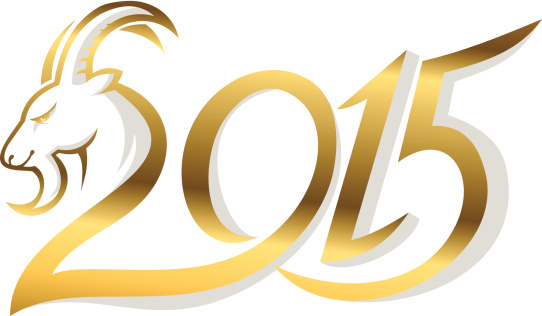 2015 Year of the Wood Sheep Forecast for the 12 Chinese Animal Zodiac Sign! Time really flies so fast, it seems that I have just recently written about the 2014 Year of the Wood Horse forecast and in what seems a short time, I am now again writing about the 2015 Year of the Wood Sheep forecast. 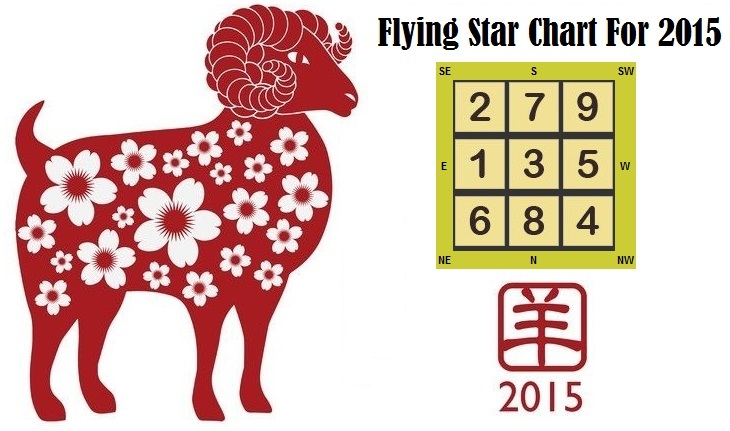 In my previous posts, 2015 Year of the Wood Sheep Feng Shui Forecast Base on Bazi, Flying Stars, and 24 Mountain Stars Formula: A Balanced Year Filled with Wealth and Resources But May Be Ruled By Arguments and Fighting (Part 1) (Part 2), I talked about the year being ruled by the #3 Flying Star, which is also called the Argumentative Star. But really this star can cause more than just arguments, so it is important for you to remember that regardless of your Chinese Animal Zodiac Sign, you need to have the Holy Trinity of Protection for the year. Note: To know more about the particular recommendation please click on the link. Some links may lead you to a different post that has different title but as you read along you’ll find that that particular recommendation is mentioned on that link. This only mean that I haven’t written about it separately. It might also lead you to a different site if I haven’t written about that particular recommendation at all. More importantly, I’m not selling any of the items below. Some are from my personal collection and some were just lifted from the net. You’ll also notice that some of the pictures are repetitive. This is for the benefit of the people who may opt to skip the signs that doesn’t matter to them. This is also the third of the series of three posts. It will be nice if you can read all three posts to get a better picture of what’s in store for the year. Kuan Kong or Namo Sangharama Bodhisattva to suppress the #3 Flying Star. Kuan Yin with Heart Sutra to actively create harmony. 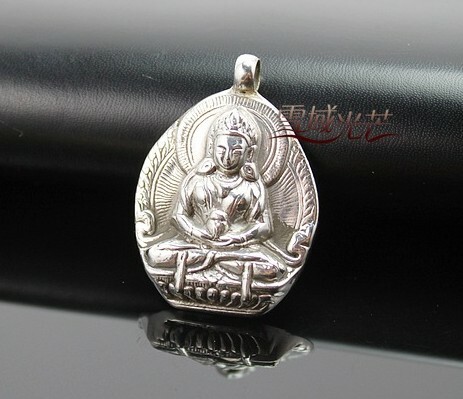 As mentioned a Kuan Yin (1) (2) (3) pendant with the Heart Sutra can be very difficult to find, and although this is my top preference, separately carrying a Heart Sutra with you will definitely work as well. My Kuan Yin pendant has the The Heart of Prajna Paramitra Sutra. 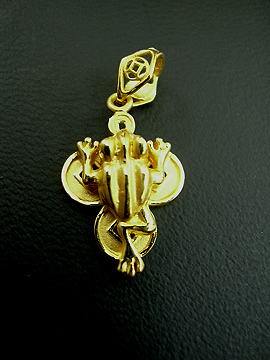 Unfortunately, it is quite difficult to look for this kind of pendant. But getting a Kuan Yin pendant and separately carrying the Heart Sutra will work as well. Lastly, a Kalachakra pendant, to continue protect you from the peripheral effects of the star, which may be cause by other people. The Kalachakra Symbol is a powerful protection symbol. It is actually ten syllable mantra compressed into one symbol. The mantra is HO HAM KSHAMALA VARAYA HUM PHAT. However, it is usually chanted with OM AH HUM thus making the complete mantra as OM AH HUM HO HAM KSHAMALA VARAYA HUM PHAT. 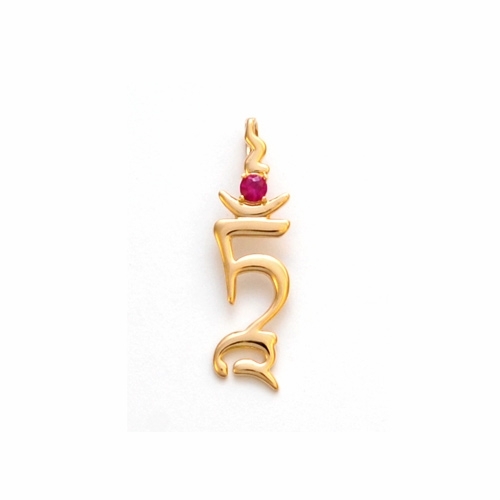 It is because off this that for the WISH FULFILLING AND BUDDHA’S BLESSING MANTRA PENDANT, I decided to put the symbolic script OM AH HUM on top of Kalachakra Symbol. You can get a Kalachakra pendant as well. It has to be mentioned that Chinese New Year or the Lunar New Year that will usher in the year of the Wood Sheep doesn’t happen until Feb. 19, 2015. That is the day when we can really say it’s the New Year. Furthermore, for the animal zodiac sign forecast, one should also remember that these are general forecast and difference will still happen base on your actual birth date. By birth date I refer to the month, day, and time. However, this should still serve as basic guideline. Now lets move to the different animal signs. Is synonymous to lucky this year. Maybe the luckiest of all the 12 animal signs, you will not lack of resources, opportunities, success, and if you play your cards right, even wealth. Your luck is brought about by the wonderful #8 Star also known as the Wealth Star! Furthermore, you are flanked by two Big Auspicious Star from the 24 Mountain Stars calculation! The name says it all and there’s no need to explain this. All you have to do is to focus on what is there to take, focus on the positive and your biggest enemy for the year is yourself if you are filled with self – doubt. The only slightly hindrance to attaining your full luck potential is by the appearance of the Wu Duo Star. This normally bring about the loss of money, however, a large group of Feng Shui experts believes that when Wu Duo appears between two Big Auspicious stars then the effects are either lessened or totally negated. Nevertheless, it is still better to keep yourself aware of this possible loss so that you can be careful. 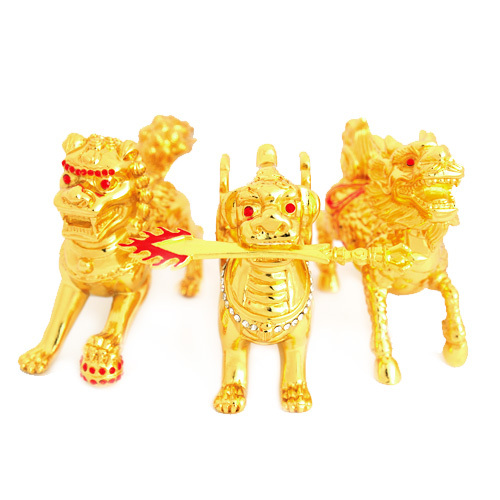 To further enhanced your wealth luck and at the same time give you the confidence you can wear a Wind Horse or Lung – Ta coupled with one of the following images Kuan Kong, Sun Wukong, Maitreya Buddha (Happy Buddha), Yellow Dzambhala, or Three – Legged Toad. Preferably wear them in gold. Image of the Lung – Ta or Wind Horse. To help manage the Wu Duo star you can wear a prayer wheel with the mantra of Bodhisattva of Compassion, Kuan Yin or Guru Rinpoche. General Traits: Very intelligent, logical and clear thinking, calm but stubborn, independent, trusting, industrious, deep and original in thought, reliable, a good leader, intolerant, peace loving. Aside from the #3 star that affects everybody, is surrounded by auspicious stars from the Flying Star formula, on the ‘house’ of an Ox lies the #6 flying star also known as the Heaven’s Blessing and Mentor Star, on the right is the #8 flying star that is also called wealth star and lastly on the left lies the #1 flying star known as the White Victory Star! All three combined creates the auspicious three – digit number 168. Furthermore, you also have the Big Auspicious star of the 24 Mountain Star formulas. The only conflict is that you’re Sui Po this year, which means you’re in direct conflict with the Tai Sui of the year, and on your left is the Annual Conflict star also from the 24 Mountain Star formulas. What does this mean? This mean that you’re greatly blessed this year and wealth is definitely within your reach. Furthermore, you may always be victorious in all your endeavors and to top it off you won’t run out of help from powerful individuals who can make things easier for you. On top of that, if you remain good and harvest good karma, help will definitely come from heaven. You just have to be careful about the Sui Po and the Annual Conflict star, because this can divert your attention from the real price. This translates into making you more susceptible to the effects of the #3 Star. So always remember that for you the best thing to do this year is simply to quietly walk away from arguments and quarrels. Don’t let it lead you to disaster and forget about better things. The Ox is also greatly affected by the #3 Ruling Star. So better watch out for your temper. To enhance the good stars wear the White Victory Star wear the Victory Banner. You can also wear the image of Kuan Kong and Sun Wukong to enhance both the #6 and #8 flying stars. 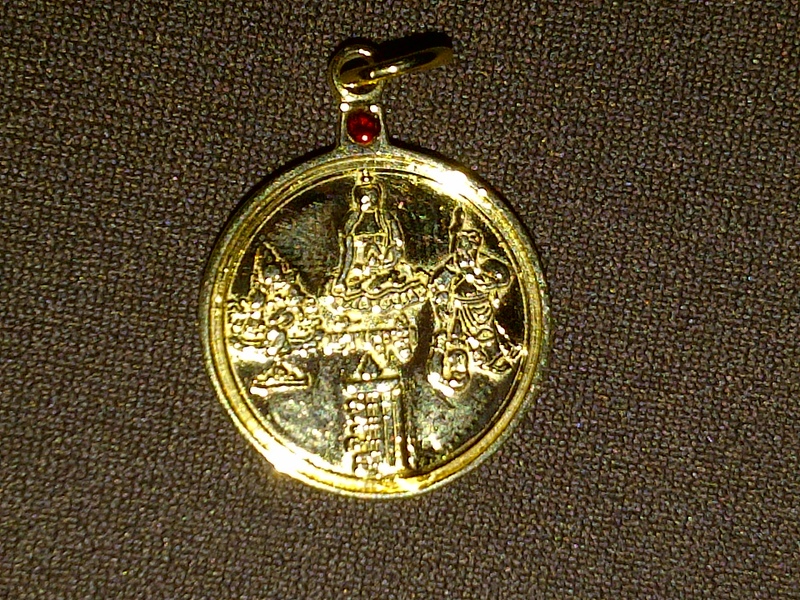 Front side of the WEALTH AND MASTER PROTECTION PENDANT. This pendant is no longer available. This is just placed here to illustrate a Sun Wukong pendant. Wear an image of the Piyao (Pi Xiu, Pixiu, Pi Xie, Pixie, Pi Yao) or Dou Mu Yuan Jun to appease the Tai Sui God of the year. 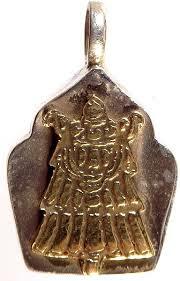 I together with a help of a reader might come up with a Master Tai Sui Protection pendant. It’s called the Master Tai Sui Protection pendant because it will bear the image of Dou Mu Yuan Jun (to know more about her please click here) and a pair of Piyao. Hopefully, at the back it will bear the Tai Sui protection prayer. But more than that it is a Tai Sui pendant that will cover all the Tai Sui God, so one need not replace the Tai Sui amulet every year. Hope this comes to fruition. 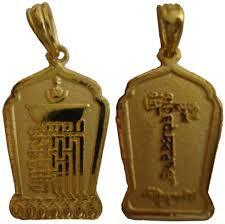 Gold Piyao pendants worn as amulets are also very auspicious. This is a Piyao designed by Lillian too. 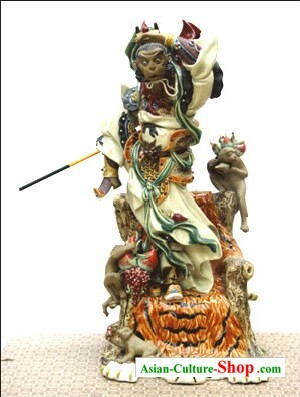 Dou Mu Yuan Jun or Goddess of the North Star is a powerful Deity to counter the effects of Tai Suey. She is said to be the creator of all the Tai Suey Gods does has the power to rule or control over them. To protect oneself from the effects of the Annual Conflict, make sure you always have something red on your body. Just a little will do. So a little red gemstone worn, as jewelry will do. Lastly, to protect oneself from the combined effects of the Sui Po and Annual Conflict stars, which create another negative chi, wear a gold Kalachakra or an image of Amitabha Buddha or Amitabha Buddha’s symbolic script. Please note that some Ox because of the effect of the Paht Chee is highly susceptible to have health issues this year. This is specifically true to Ox born in the years 1973 and 1985. So wear an image of the Medicine Buddha or Medicine Buddha’s symbolic script or a prayer wheel containing the mantra of Medicine Buddha. 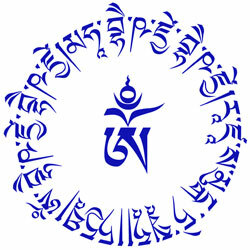 Symbolic Script of the Mantra – TADYATHA OM BHEKANDZYE BHEKANDZYE MAHA BHEKANDZYE BHEKANDZYE RADZA SAMUGATE SOHA. At the middle is its seed syllable. 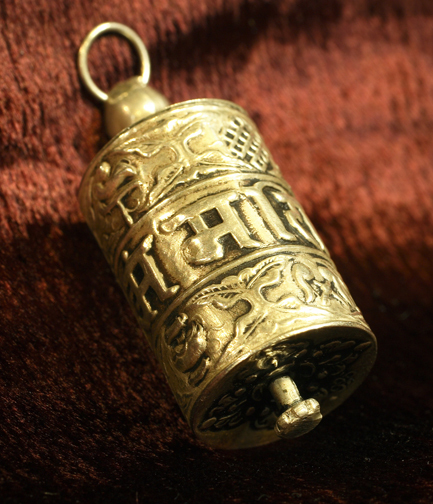 Prayer Wheel Pendant. Different mantras can be placed inside the prayer wheel. 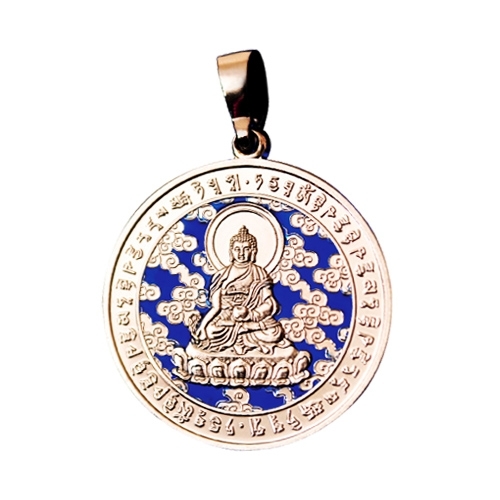 Get one that has the mantra of Medicine Buddha. Is another animal sign that enjoys tremendous luck, while you don’t have the Wealth Star, remember that base on the Bazi of the year wealth is quite accessible for all of us. But you do have the #6 Flying Star and the #1 Flying Star, this means with the help from mentors or influential people and from Buddhas, Bodhisattvas, Deities, Gods, you can certain attain success in all your endeavors. However, the 24 Mountain Stars formula of Feng Shui shows you are affected by the Annual Conflict and you are slightly facing the Three – Killings. The Annual Conflict star will make you more susceptible to the #3 Flying Star that is also known as the Argumentative Star. The Three – Killings might also present some problems. Normally, the way to manage the Three Killings is to confront it but this year because the 5 Yellow Star resides in the same sector, confronting the 3 Killings might do more harm than good. But the good news is that you also the Heavenly Seal, which means help from Heaven will surely come your way, this should temper all the bad effects a little. Lastly, don’t forget that you are also slightly facing the Tai Suey, so better protect yourself from the ill effects of the wrath of the Tai Sui God. To enhance the good stars wear the White Victory Star wear the Victory Banner. You can also wear the image of Kuan Kong or Sun Wukong to enhance both the #6 and #8 flying stars. Alternately, a citrine with 9 – eye DZI will also help bring in wealth luck. Nine Eye DZI Bead on a string of Citrine. To deal with the 3 Killings, all you have to do is wear an image of the Three Celestial Guardian, namely the Piyao, Fu Dog and Chi Lin (Qi Lin), or you can also wear an image of 3 different Buddhas, or Bodhisattvas, or Deities, or Taoist Gods or Goddesses. For those who have the WISH FULFILLING AND BUDDHA’S BLESSING MANTRA PENDANT, please note that the image of Medicine Buddha, Kuan Kong, and Yellow Dzambhala are more than enough to deal with the 3 Killings. General Traits: Talented, ambitious, shrewd, patient, cautious, diplomatic, sophisticated, cultured, old-fashioned, gentle, good-heated, sympathetic, affectionate, loving, often artistic, self-indulge, over-attach to people/objects, emotional, moody. Had a tough year this 2014. A lot of people born under the sign of rabbit fell into some kind of health issues. Some were easily remedied with rest or popping a few pills, but a lot was a lot more serious. This year should be better, but a lot of you might still continue feeling a little under the blue. 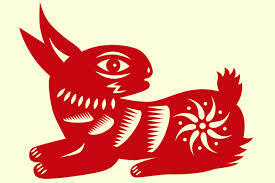 But other than your health issues, this should be a good year for people born under the sign of the rabbit. The #1 Flying Star called White Victory Star goes into your sector, this means that you will be victorious with your endeavors. Success will come easy to you. On top of that in the 24 Mountain Star formula, you got the General Star or Star of the General. This means Rabbit born people who are in the leadership position will find themselves becoming real leaders, there will be more strength in your voice and you will be commanding with confidence. You are also directly facing the 3 – Killings, and as we said this used to be an easy star to deal with, but this year because it resides at the West and is joined by the Five Yellow Star, it is best to avoid directly confronting the 3 – Killings. To help manage your health concerns, you can wear any of the following: Medicine Buddha pendant, Medicine Buddha prayer wheel, Wu Lou or Holy Gourd. To further enhance your power and authority, you can wear an image of Kuan Kong or a Ruyi. Lastly, wear a Victory Banner to enhance the #1 White Victory Star. General Traits: Intelligent, full of energy, witty, , artistic, enthusiastic, inventive , enigmatic, perfectionist, humorous, headstrong, generous, egostical, aristocratic, over-demanding, prone to worry, quick-tempered. Is one of the luckiest signs the past years, but in the year 2015, which is lead by the Wood Sheep you’ll see yourself losing some steam. You’re usually brimming with self – confidence, however, due to the effects of the year’s bazi, you’ll find yourself losing some of these confidence. You might face a lot of challenges also. Whenever you faced self – doubt please just remember that you are right beside the #1 Flying Star, which is the White Victory Star. This should aid you in remembering that you can still be victorious as long as you regain that self – confidence and do away with all the negative thoughts. More than the White Victory Star you should also know and always remember that you have the Big Auspicious Star from the 24 Mountain Star formulas. This means that this should be an auspicious year for you. Plus you also the Star of Golden Deity, thus you can expect help from the Gods. However, the 24 Mountain Stars formula of Feng Shui shows you are affected by the Annual Conflict and you are slightly facing the Three – Killings. The Annual Conflict star will make you more susceptible to the #3 Flying Star that is also known as the Argumentative Star. The Three – Killings might also present some problems. Normally, the way to manage the Three Killings is to confront it but this year because the 5 Yellow Star resides in the same sector, confronting the 3 Killings might do more harm than good. Also you’re afflicted with the Illness Star, which is the #2 Flying Star. While this year the said star is not as strong as last year, it is still wise to make sure that you take care of yourself, what your health and do not participate in any dangerous activities. Self – confidence is something difficult to deal with because it has something to do with your personality, so the best cure for this is really to remind yourself your worth. Nevertheless, to help keep an upbeat disposition in life, do wear a Star of David Crystal pendant; wear something that is made of citrine, amethyst, or clear quartz. 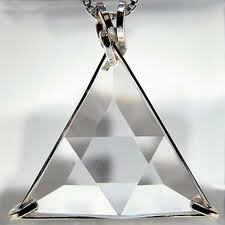 The Star of David pendant is a crystal pendant that is faceted in such a way that they call Star of David. It has a lot of uses, but one use of Star of David is to help strengthen your inner essence, and help renew energies. Enhance the White Victory Star by wearing the Victory Banner and this should serve as a reminder to yourself that you do have the White Victory Star. Wearing a Kuan Kong will also help enhance this star. 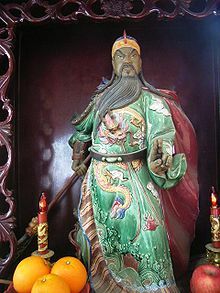 Kuan Kong also spelled as Guan Gong is a warrior god. He is a very good protector and wealth god. 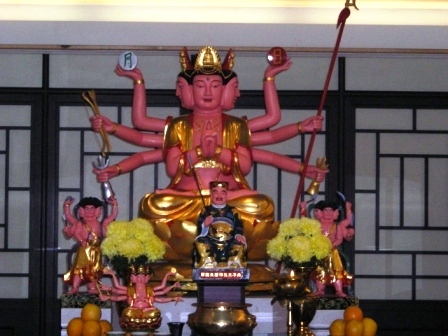 The best way to activate the Star of Golden Deity is by inviting to your house or wearing an image of a Buddha or Bodhisattva or Deity or a Taoist God in gold. I suggest one of the following: Kuan Yin, Kuan Kong, Sun Wukong, Yellow Dzambhala. In fact, you can get a different image for your house and a different one for a pendant. 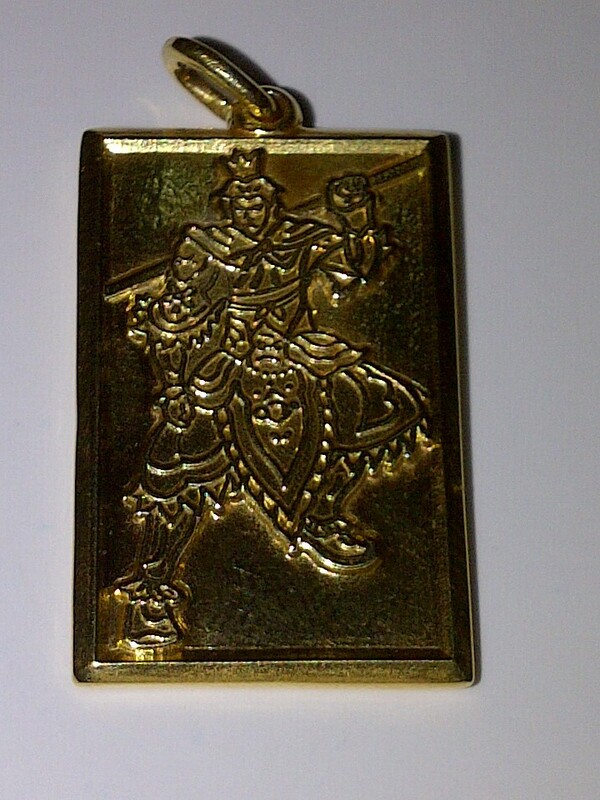 But since you are also suffering from self – doubt and lack of self – confidence I strong recommend wearing a gold pendant of an image of Kuan Kong or Sun Wukong. This is from my private collection and is made of Smoky Citrine. I was just lucky to get this on ‘bargain’. Should also have a good year. This is largely because of the effects of this year’s bazi to the fortune of the horse. You don’t have much wealth luck this year if fortune is going to be solely base on the Flying Star formula, but remember, wealth luck is accessible for all of us this year base on the year’s bazi. Your personal Windhorse is also your greatest asset this year. You should be ready to take charge of the success that comes your way this year, don’t be timid, and while caution is always advice, be bullish and aggressive but at the same you should remain humble. Furthermore, base on the 24 Mountain Stars formula, two Big Auspicious stars also visit you, this is great news, and on top of that, like the Dragon, you also have the Star of Golden Deity. All these should be enough to make your year a wonderful one. But also take note that you were visited by the #2 Flying Star that is the Illness Star, but this year the star is not very strong but still it is best to take caution, because if you’re naturally weak or unhealthy this could have a grave effect on your health. Take note, you should also not tempt fate by engaging in dangerous activities or sports. 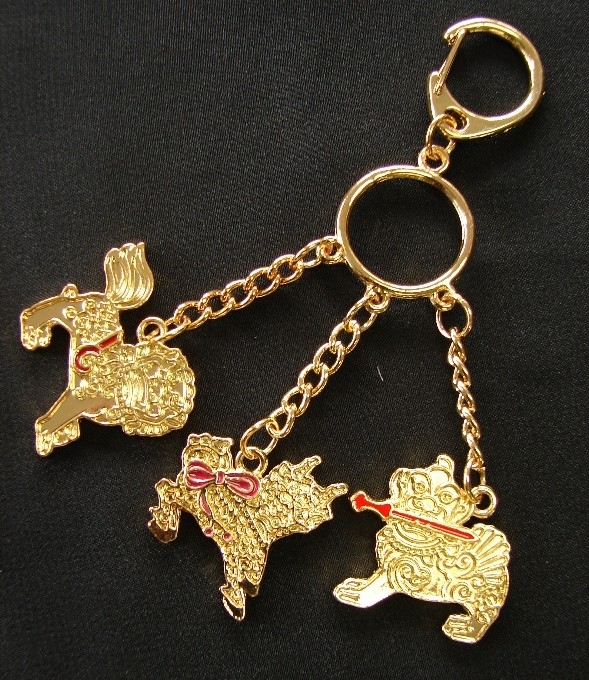 To attract more wealth luck you should have one of the following: Kuan Kong, Sun Wukong, Three – Legged Toad. To further enhance your greatest assets this year that is the Wind Horse or Lung – Ta, wear an image of the Wind Horse or Lung – Ta. To manage the illness star wear one of the following: Image of the Medicine Buddha, Medicine Buddha Prayer Wheel, gold or Jade Wulou. General Traits: Mostly Popular and loves the attention, admired, friendly, sexually-appealing, carefree, optimistic, pleasure-seeking, imaginative, inquisitive, hardworking, loyal, good talker, capable, practical, energetic, impulsive, moody and egoistical. Is going to have a balanced year that in the sense that the luck that affects you is quite mixed. Because the sheep is an astrological ally, this would mean that the year would be generally in favor of you. Nevertheless, you have the flying star #7 known as the Violent Star or Star of Violence. There is a potential of robbery or some sort of violence happening in your life. So be extra careful and avoid going out at night and be carefree or careless. While wealth luck is generally good for a lot of people, you should take extra care in being cautious in how you spend money. It is also possible that even if money is already within reach, sometimes you’ll see it getting lost. The 24 Mountain Stars formula also indicates that you were sandwiched by two Big Auspicious Star, which means that this should be an auspicious year for you, but another adversary for the year is the Star of Reducing Energy that will manifest itself in making you feel tired and losing both physical and inner energy, this is further heightened by the fact that you are also in side conflict with the Illness Star. So better watch out for your health and always ensure that you stay in top shape because this will be your greatest stumbling block from attaining your full potential for the year. Remember, it is not only the body that may feel tire, but also your inner drive, your inner energy. On top of that, you’re also in side conflict with the Tai Sui or Tai Suey, thus if not managed this might pose further problems with the Tai Sui God making things harder for you. To counter the effects of the #7 Flying Star you can invite into your home and wear the image of the following: Kuan Kong, Sun Wukong, Amitabha Buddha, or Kalachakra symbol. 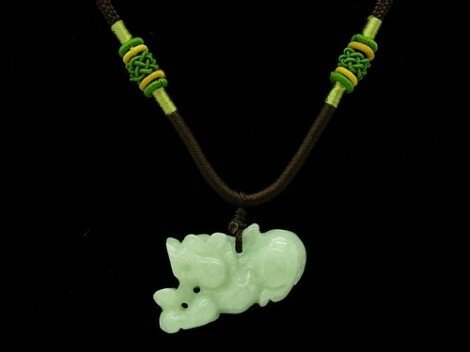 A Blue Rhinoceros with a Blue Elephant Feng Shui charm will also be helpful. To be able to tap into the year’s wealth luck and safeguard it you should wear a 9 – Eye DZI with Citrine or Three – Legged Toad or an image of the Yellow Dzambhala, and safeguard it with Kuan Kong or a Lock Coin. 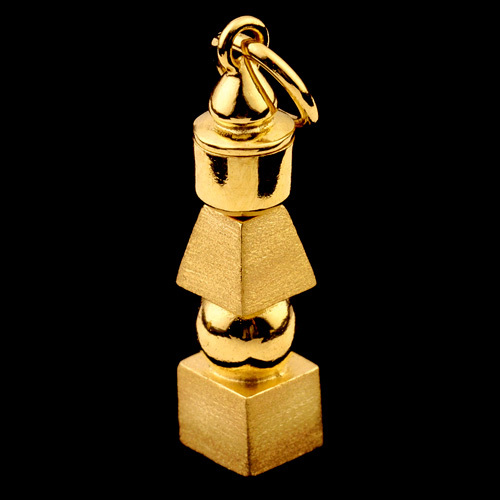 This is a lock coin gold pendant, which is sometimes mistaken as a money bag. If you find your luck quite unstable, or easily flowing out, use the lock coin to act as a safeguard for your luck to make it more stable. For the Star of Reducing Energy, always make sure that you keep yourself in shape, and wear a Star of David made of amethyst or clear quartz. Furthermore, you’re also affected by the Illness Star and the Star of Reducing Energy might make it’s effect worse than normal, so you should definitely have Medicine Buddha pendant or Medicine Buddha Prayer Wheel. I personally have a hand held, table top, and pendant Prayer Wheel. A Prayer Wheel has a very good calming effect. The prayer wheel will vary depending on the mantra placed inside. Nowadays, people use a prayer wheel with a microfilm to significantly increase the numbers of mantras that’s inside the prayer wheel. Lastly, wear an image of the Piyao (Pi Xiu, Pixiu, Pi Xie, Pixie, Pi Yao) or Dou Mu Yuan Jun to appease the Tai Sui God of the year. 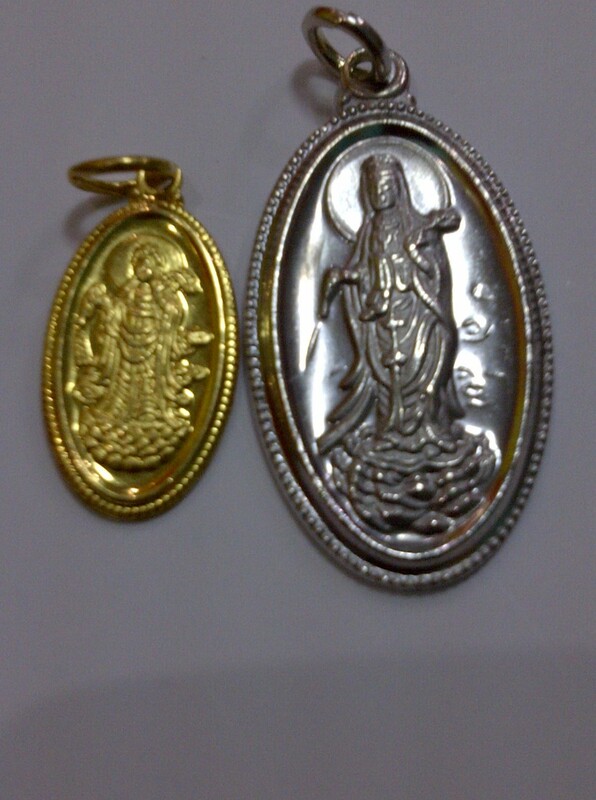 I together with a help of a reader might come up with a Master Tai Sui Protection pendant. 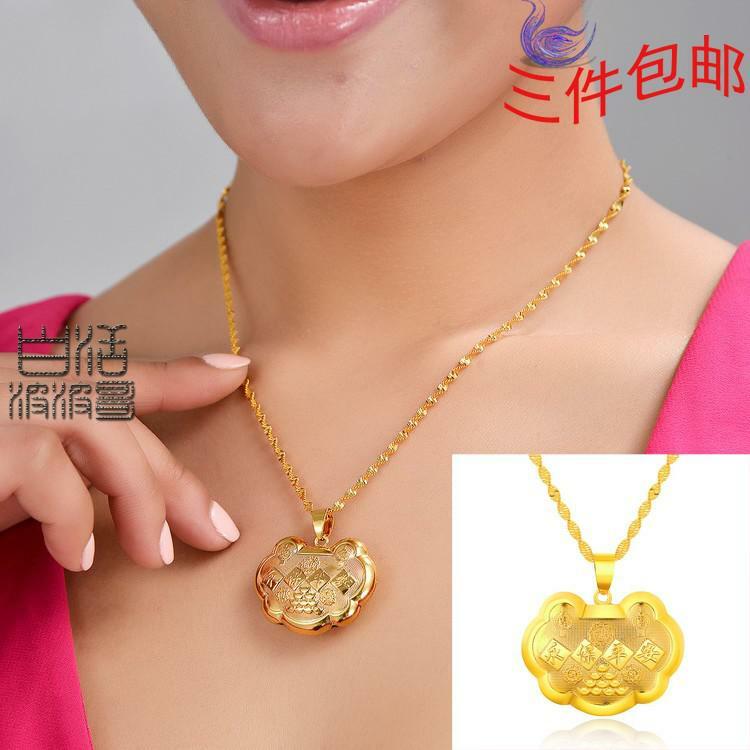 It’s called the Master Tai Sui Protection pendant because it will bear the image of Dou Mu Yuan Jun (to know more about her please click here) and a pair of Piyao. Hopefully, at the back it will bear the Tai Sui protection prayer. But more than that it is a Tai Sui pendant that will cover all the Tai Sui God, so one need not replace the Tai Sui amulet every year. Hope this comes to fruition. General Traits: Quiet, reserved, sympathetic, sincere, patient, unemotional, practical, realistic, optimistic, sincere, non-judgmental, ambitious, determined, easily gets stressed. Might have the notion or belief that this is going to be good year because this their year. Like always, I again would like to remind everybody that this is a misconception, and there’s no exception for this year. But it doesn’t mean it is going to be an extremely bad year for the Sheep (some will say Goat or Lamb). One thing you should realize is that you should appease the Tai Suey, if you do this properly you will definitely get his support and he will definitely help in making this year a very good year for you. Base on the 24 Mountain Stars formula you have both the Big Auspicious and Small Auspicious stars, the difference is only in the amount of auspiciousness that they will bestow on you, but all you have to understand is that these are good stars and auspiciousness is definitely just around you. You have to take note also that you have the #9 Flying Star or the Multiplying and Future Prosperity Star. Technically speaking, this is neither a good or bad star. The power of this star is to let you reap whatever you sow. This star basically multiplies whatever karma you accumulate. If you do more good things you’ll have more good luck in the future, but if you continue to do a lot of bad things, you multiply your negative karma as well. So if you’ve been good you need not worry because this year you’ll reap some of the good karma and help you go through the year, but if you’ve been bad you should try to negate all those negative karma and take advantage of this star by sincerely doing good. Remember, the operative word is sincerely. Unfortunately, you’re in side conflict with the #7 Flying Star (also known as the Violent Star) and the #5 Flying Star (also known as the Five Yellow Star), which is one of the most dreaded stars. Thus you have to be really careful and ensure that you tempt fate by going out in the evening a lot. Always make sure that you are cautious, not totally paranoid, but cautious. The Five Yellow Star is also said to bring in 5 different kinds of misfortunes, so ensure that you get the help of the gods to keep you safe. Lastly, your personal Lung – Ta or Windhorse is not very strong either, and this might make you feel a little down. So better strengthened your personal Lung – Ta also. 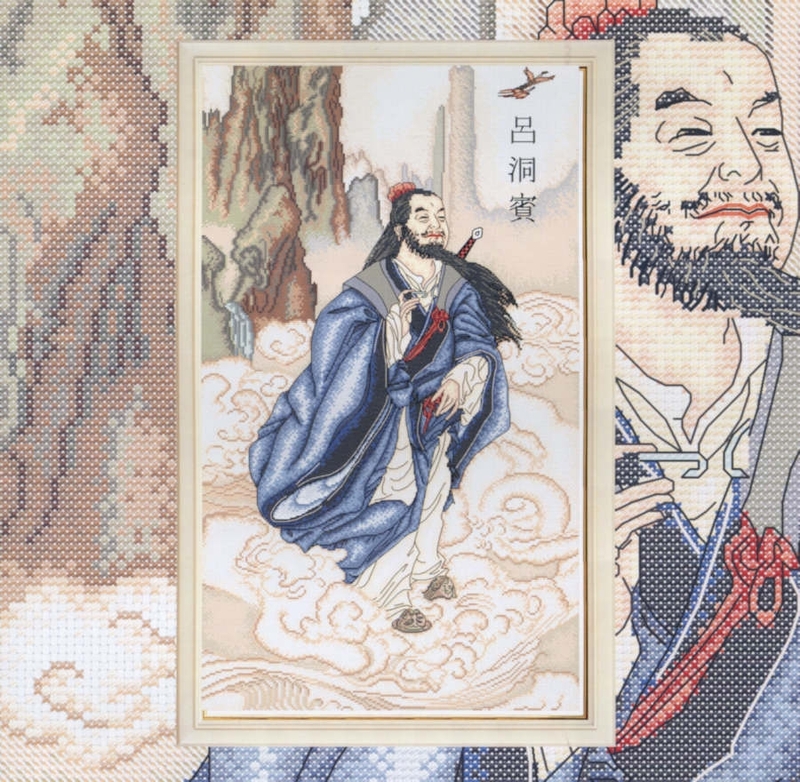 The first thing you should do is wearing an image of the Piyao (Pi Xiu, Pixiu, Pi Xie, Pixie, Pi Yao) or Dou Mu Yuan Jun to appease the Tai Sui God of the year. 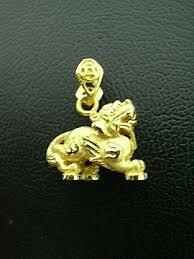 I together with a help of a reader might come up with a Master Tai Sui Protection pendant. It’s called the Master Tai Sui Protection pendant because it will bear the image of Dou Mu Yuan Jun (to know more about her please click here) and a pair of Piyao. Hopefully, at the back it will bear the Tai Sui protection prayer. But more than that it is a Tai Sui pendant that will cover all the Tai Sui God, so one need not replace the Tai Sui amulet every year. Hope this comes to fruition. But more than that, on the entry of Feb 19, 2015 (midnight of Feb 18, 2015 and Feb. 19, 2015) do light incense on your altar or west section of your house. To manage or enhance the #9 Flying Star chant mantras OM AH HUM and OM HANU PASHA BHARA HEYE SOHA, 108x each everyday, or you can also wear their symbolic script. 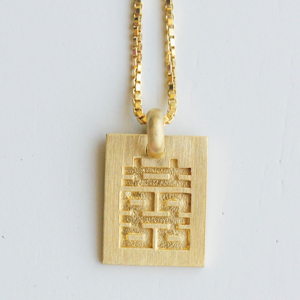 The Kalachakra Pendant is one of the most powerful Buddhism tools to counter negative energies. Kalachakra doesn’t have a direct translation in any other language but it loosely means ‘the one with 10 powers’. 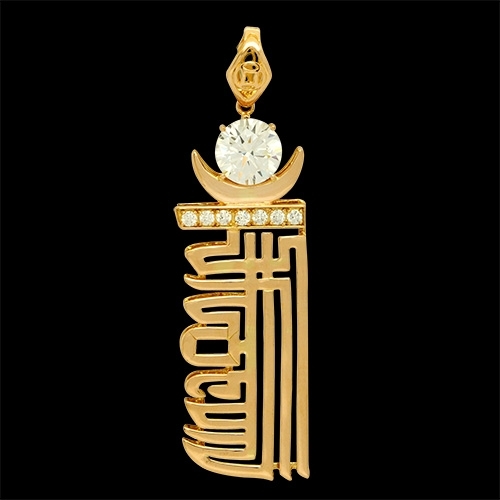 It is also a very powerful protection pendant. You’ll normally see Buddhist monk wear this somewhere around their body. I personally have 3 different Kalachakra pendants. One is made of crystal quartz engraved with a the Kalachakra, another one is made of stainless steel but enclose on it are colored Kalachakra sand and was personally blessed by Lama Zopa Rinpoche. The third Kalachakra pendant is a white gold Kalachakra with Kalachakra Mandala Sand from one of the Kalachakra initiation conducted by the Dalai Lama, this third piece is truly a collector’s item because there are only 1,000 pieces made. To manage the Five Yellow Star or #5 Flying Star, wear a gold Kalachakra or a 5 – Element Pagoda (Five Element Pagoda) note that the pagoda pendant should be made of metal, either silver or gold, not jade or other semi – precious stone. To manage your weak Windhorse wear an image of the Lung – Ta or Windhorse. It might also be extremely beneficial if you invite Kuan Yin, the Bodhisattva of Compassion to the Buddhist and Goddess of Mercy to the Taoist into your life. 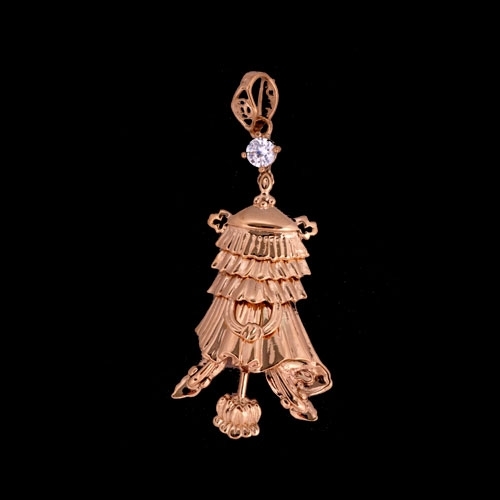 You can have her as a pendant or as an image in your home. Remember, the Kuan Yin, together with Kuan Kong and the Kalachakra is part of the Holy Trinity of Protection this year. General Traits: Lively, quick-witted, crafty, mercenary, opportunist, original thinker, clever, innovative, self-centered, devious,amusing, sociable, amiable, very ambitious. Has superb inner essence and Windhorse or Lung – Ta and this is your greatest asset for the year. Just remember to keep an open mind and remember while challenges await you, draw strength from your inner strength and go forward. Remember that for the year it is important to focus on small successes that will lead to the big ones. Do not be too aggressive and ignore the small ones just because you have your eyes set on the golden apple. Remember before you to the million you will need to start with the smallest coin. The Flying Star formula shows that you have the Multiplying and Future Prosperity Star, technically speaking; this is neither a good or bad star. The power of this star is to let you reap whatever you sow. This star basically multiplies whatever karma you accumulate. If you do more good things you’ll have more good luck in the future, but if you continue to do a lot of bad things, you multiply your negative karma as well. So if you’ve been good you need not worry because this year you’ll reap some of the good karma and help you go through the year, but if you’ve been bad you should try to negate all those negative karma and take advantage of this star by sincerely doing good. Remember, the operative word is sincerely. But your luck will largely depend on what you sow before. You’re also in side conflict with the Tai Sui so it is important that you appease him because an angry Tai Sui can make it a difficult year for you. Remember that you are also in side conflict with the #7 Flying Star, also known as the Violent Star or Star of Violence. Thus it is important that you be very careful. This coupled with the Robbery Star of the 24 Mountain Stars formula is a sure indication that you will have to be careful, be wary of possible backstabbing and betrayal also. There is a possibility of loss of money also. Lastly, you are also in side conflict with the dreaded #5 Yellow Star, which 5 kinds of misfortunes, thus you must remember that you should definitely protect yourself against this star. While you are in side conflict with the 3 – Killings this should pose no threat to you. Luckily, you also have the Star of Small Auspicious, and this should reiterate that you should focus more on smaller successes that leads to the big one rather than go straight for the biggest prize. Enhance your Windhorse by wearing an image of it, which is also known as Lung – Ta. 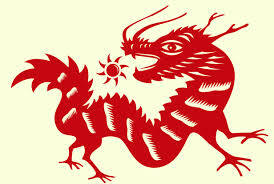 The Windhorse or Lung-Ta is another powerful Buddhist symbol that brings success and prosperity. For those who wants to get a promotion or advancement in their career or business having the Windhorse around your body will aid you to achieve this dream. Also the Lung-Ta or Windhorse may bring travel luck. To manage the #7 Violent Star alone, you can carry the Blue Elephant and Blue Rhinoceros charm. But to manage the combine effects of the Star of Violence of the Flying Star formula and the Robbery Star of the 24 Mountain Stars formula you SHOULD combine either an image of Kuan Kong or Sun Wukong or Amitabha Buddha with the Kalachakra or the image of Ushnisha Sitataputra (also known as the White Umbrella Goddess). The Kalachakra Symbol is a powerful protection symbol. It is actually ten syllable mantra compressed into one symbol. The mantra is HO HAM KSHAMALA VARAYA HUM PHAT. However, it is usually chanted with OM AH HUM thus making the complete mantra as OM AH HUM HO HAM KSHAMALA VARAYA HUM PHAT. It is because off this that when I designed the Wish Fulfilling and Buddha’s Blessing Mantra Pendant, I decided to put the symbolic script OM AH HUM on top of Kalachakra Symbol. The Kuan Kong should help enhance the Star of Small Auspicious. General Traits: Moody, dreamy, talkative, vain, outgoing, extravagant, over-confident, self-confident, attentive to friends, flamboyant, unaided, dignified, handsome, headstrong, arrogant, vain. Is going to face a challenging year ahead, BUT THE GOOD NEWS IS THAT YOU HAVE A STRONG LUNG – TA AND INNER ESSENCE SO THIS SHOULD HELP YOU GET THROUGH IT. 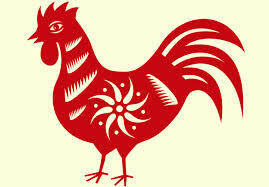 The energies of the year are quite hostile towards people born under the sign of the rooster. The best thing to do for the Rooster this year is to work hard, strive hard, but keep a low profile. Don’t challenge the universe. Wealth luck is not impossible because the year’s bazi shows that wealth luck is attainable and therefore if you keep yourself protected you should be able to go through the year with problem. You do have to be wary about the dreaded Five – Yellow Star or the #5 Flying Star though. This star is also Wu Wang; it says to cause 5 kinds of misfortunes that may affect your health, wealth, personal relationship, safety amongst others. Thus ensure other than getting the support of the Buddhas or Bodhisattvas or Deities or Taoist Gods to keep you protected and safe. You do have to watch out for your temper and manage stress because little things might lead to bigger problems. The #3 Flying Star, which is the ruling star that affects all the animal sign, will also affect you more than the other signs also. Thus remember to always keep your temper and feelings in check. You’re also affected by the Three – Killings, and if you read my posts about the 2015 Year of the Wood Sheep forecast, I said that for the year you shouldn’t really deal with the 3 – Killings because it is with the 5 – Yellow Star, but because you’re in the same sector, you will be naturally dealing with it, therefore it should not pose any problem. Nevertheless, it is still best to keep yourself protected. Lastly, also with 24 Mountain Stars Formula, you are further affected by the Natural Disaster Star, and this stars doesn’t really just refer to rains or earthquakes but may also mean personal disasters that may naturally occur. 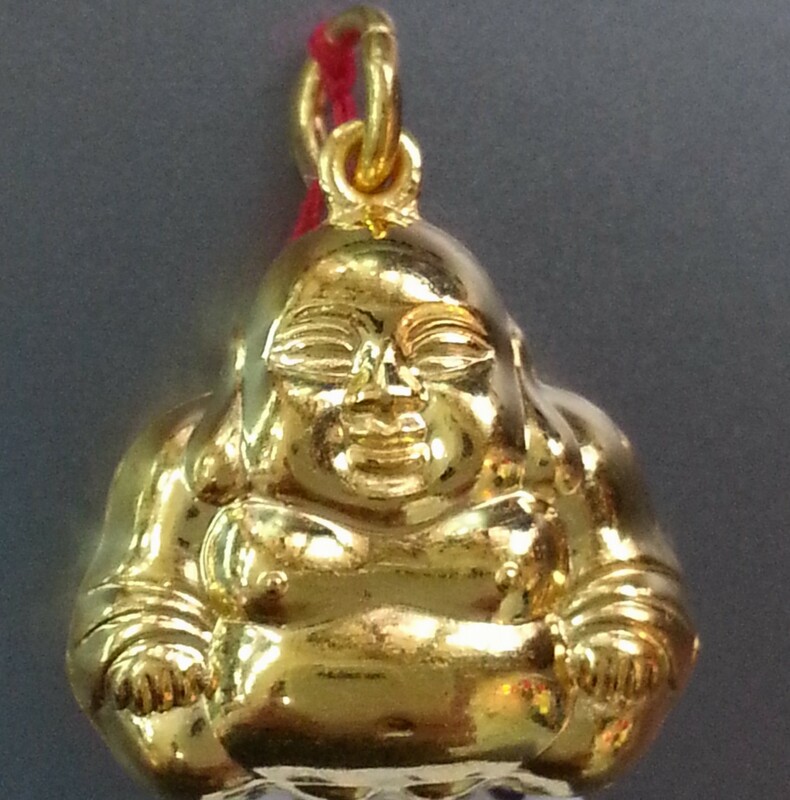 Front side of the WISH FULFILLING AND BUDDHA’S BLESSING MANTRA PENDANT. Putting this here to remind those who already have the pendant that this will work as well for the Three Killings. Please note that no more request for the pendant are being entertained. Wear a Windhorse or Lung – Ta to further enhance it and add a Star of David made of either citrine, amethyst, or clear quartz to further enhance your inner strength. Add the seed syllable OM also to further help enhance life forces. Furthermore, a Victory Banner is also going to be helpful in making sure you get some victories in your endeavor. To manage the #3 Flying Star that rules all of us this year, make sure you have the Holy Trinity of Protection for the year namely the Kuan Yin with the Heart Sutra (you can carry the Heart Sutra separately), Kuan Kong and the Kalachakra. Kuan Yin and the Heart Sutra will help promote harmony and you’ll need that both with your personal and professional life. 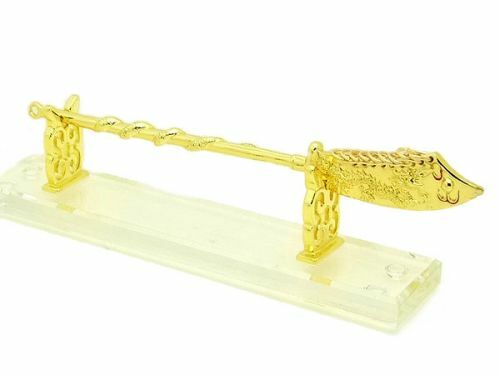 It will also be very beneficial if you wear a 9 – Eyed DZI with citrine. And to help take away obstacles, you can wear a Guru Rinpoche Prayer Wheel or an image of Ksitigarbha Bodhisattva. 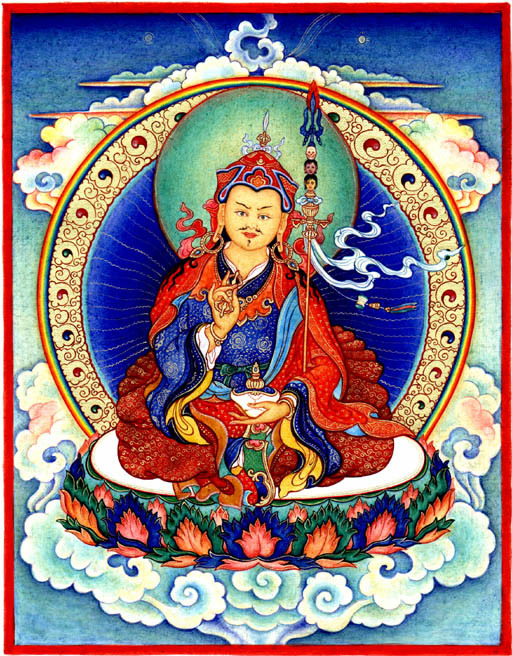 Guru Rinpoche is known for taking away obstacles. From my personal collection. A rare Red Amber Ksitigarbha. 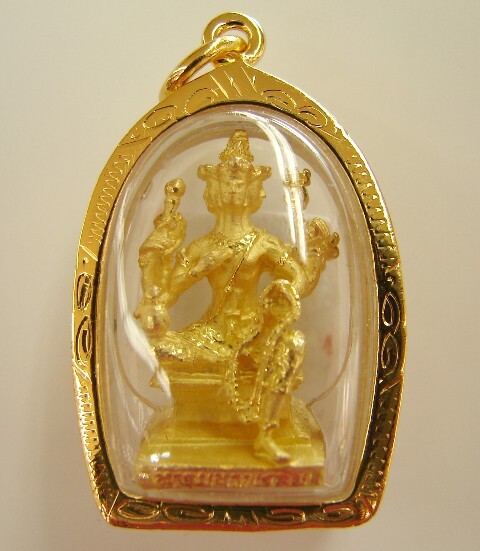 Unfortunately, it is quite difficult to get a Ksitigarbha pendant unless you’re from Malaysia, Hong Kong, or Singapore. Remember to always ask for blessings and from protection from the heaven. And donating blood might be a good way to help take away some of the danger. Also wash yourself with a salt bath for the first 7 days of the week, and another 7 days in the middle of year. 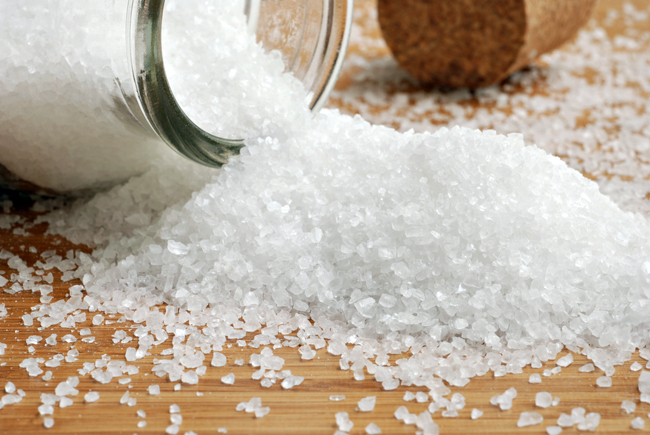 Getting a Namtso Salt for your bedroom, office, and living room will also be very beneficial. Lastly, get extra protection from the Natural Disaster by wearing an image of one of the following: Kuan Kong, Sun Wukong, and Amitabha Buddha. General Traits: Loyal, just, strong sense of morality, reliable, dutiful, patient, caring, sincere, compassionate, honest, generous, intelligent, confident, idealistic, affectionate, a worthy leader, tend to become lazy and depressed, pessimistic. Will see that while wealth luck is within reach, this is a year to focus more on family, personal, and scholastic life. 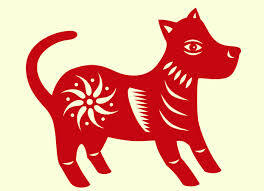 The wealth that a person born under the sign of a dog will come from this year bazi and not the flying star. This means that you will have to be more resourceful that usual, and you can get this luck by having a scholastic approach, meaning do research and study about the situation carefully. Whatever you do, remember career and wealth should not be your main goal this year. It should be your personal and family life. The 24 Mountain Stars formula also indicate that you have the Star of Annual Killing or Yearly Killing, the effect of this star is that you have the tendency to become emotionally imbalance and mentally imbalance, this does not mean that you’ll go crazy, but this will mean that you may not be in your usual self when dealing with things. I hate being negative, but it seems that this star is quite strong this year and that some event that may be traumatic and may grave effect on your psychological and emotional well – being is really likely to happen. Furthermore, the Star of the Yin House also visits you, this means you will be more susceptible to the effects of Yin energies and you have to make sure that you continuously have a dose of Yang energy to counter this. Lastly, you are also in side conflict with the Three – Killings, but this should not pose any serious problem but it is still better to protect yourself from it. Before we end the forecast for the Dog, you should also remember that you’re in side conflict with the 5 Yellow Star of the flying star formula, this star is said to bring 5 kinds of misfortunes, thus it is best to keep yourself protected from this star. 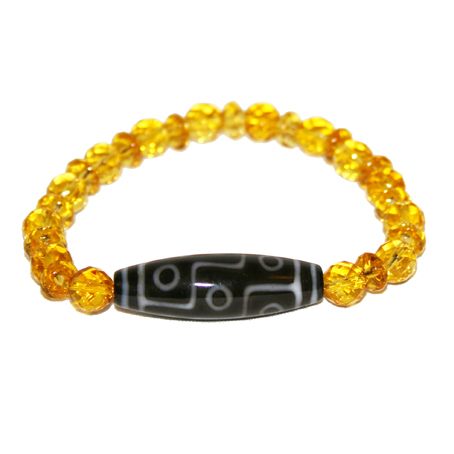 To enhance wealth luck wear the 9 – Eye DZI with citrine. 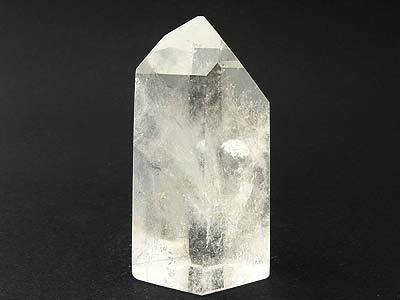 To enhance your scholastic luck, get a Clear Quartz Generator and put it on your study or worktable. For married Dogs, do wear the double happiness symbol. 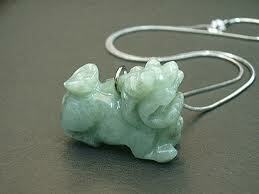 To help suppress your Star of Annual Killing, wear a gemstone, I suggest going for jade. You can also wear the seed syllables HUM or TAM. 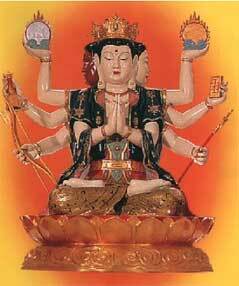 Combine this with the image of the Kalachakra and a protective Buddha or Bodhisattva like Amitabha Buddha, Kuan Kong. Note the Medicine Buddha is also a protective Buddha. It’s quite easy to manage the Yin House, engage in Yang activities like sports, go out and enjoy nature specially the sun, play positive games, eat out with friends, listen to good music, and I know my friend and reader DU will be happy to hear this, wear gold. By gold I mean yellow gold, make this in the image of Buddhas or Bodhisattvas and other powerful images to make it more Yang. Lastly, to manage the Five Yellow Star or #5 Flying Star, wear a gold Kalachakra or a 5 – Element Pagoda (Five Element Pagoda) note that the pagoda pendant should be made of metal, either silver or gold, not jade or other semi – precious stone. General Traits: Just, discerning, wise, intellectual and well-informed, lucky with money and in friendship, always admired, self-indulgent, cultured, loyal, reliable, may be naïve at times, loves to gain more knowledge, may be flamboyant. Has quite a confusing year ahead. Wealth luck both from the Flying Star and the year’s Bazi or Paht Chee is available for the Pig or Boar to take, however, initial glance on the year’s bazi to the effects on a person born under the sign of the pig shows that there is some form of lethargy that will be experienced. Your personal Windhorse is also somewhat weakened and this might have an effect on your overall success and victorious luck for the year. You might feel easily disappointed or discouraged. On top of your inner essence is a little weak thus making you more susceptible to negative energies or negative chi. You’ll also find yourself better pursuing personal and family luck rather than career and wealth luck, but this doesn’t mean that the last two will be elusive it only means, your personal and family life should take a front seat this year. When it comes to money or career, it is better if you engage more on a scholastic approach, this doesn’t mean that your luck is limited to education or research but whatever you do you should do your research and study the matter really well. The 24 Mountain Stars formula shows that you the Star of Big Auspicious and the Earth Seal Star. 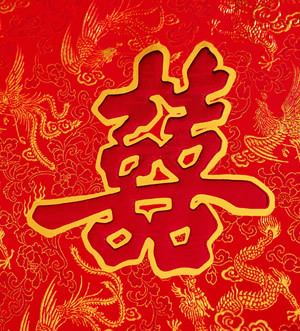 The Big Auspicious star will bring a lot of auspiciousness to different aspects of your life and it might balance out some of the negative effects of the flying star and the year’s bazi or Paht Chee, but what you really should be happy about is the Earth Seal Star, because this brings about stability in all your endeavors. However, those who will find themselves changing career might not benefit from this star so much. However, you have to be careful about the Yin House Star. This means that the star will make you more vulnerable to yin energies or may make you more susceptible to it. The effects depending on the how much Yin attracts may be from a simple setback, slight fever, or to accidents and grave misfortune. You are also in side conflict with the Five Yellow Star, the effect of this star is greater for people born under the sign of the Dog, but nevertheless it is better if you protect yourself from the 5 misfortunes brought about this star. 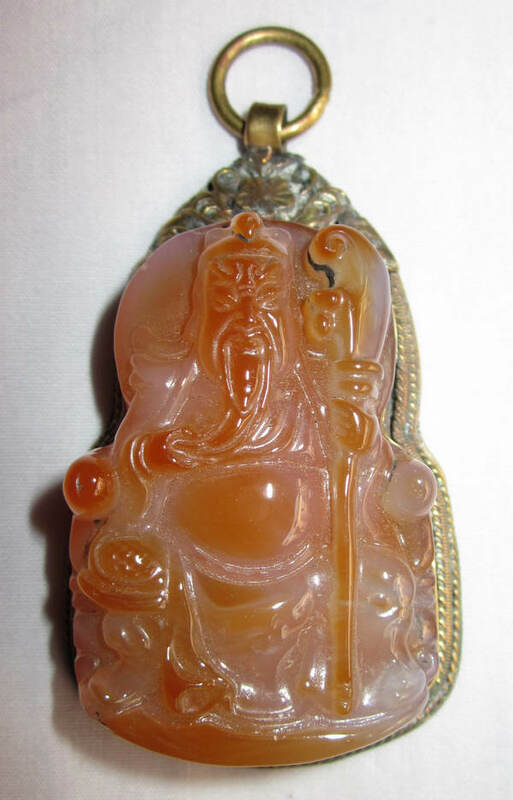 Wearing the 9 –Eyed DZI with citrine or images of Wealth Gods will enhance your wealth luck. Get the Clear Quartz Generator to enhance scholastic luck. Similarly, wearing pendants with image of Manjushri, Lu Dongpin or Shakyamuni Buddha will also enhance your scholastic luck. 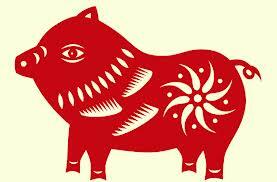 For married people born under the sign of the Pig, wear a double happiness symbol. Of course, wearing a Windhorse is also highly recommended. And to strengthen the Star of Earth Seal, wear any gemstones. 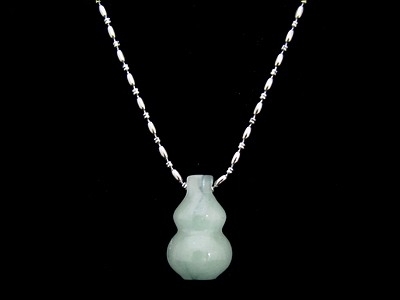 I personally believe that everybody should have at least one jade, so hit two birds in one stone, and just wear jade. 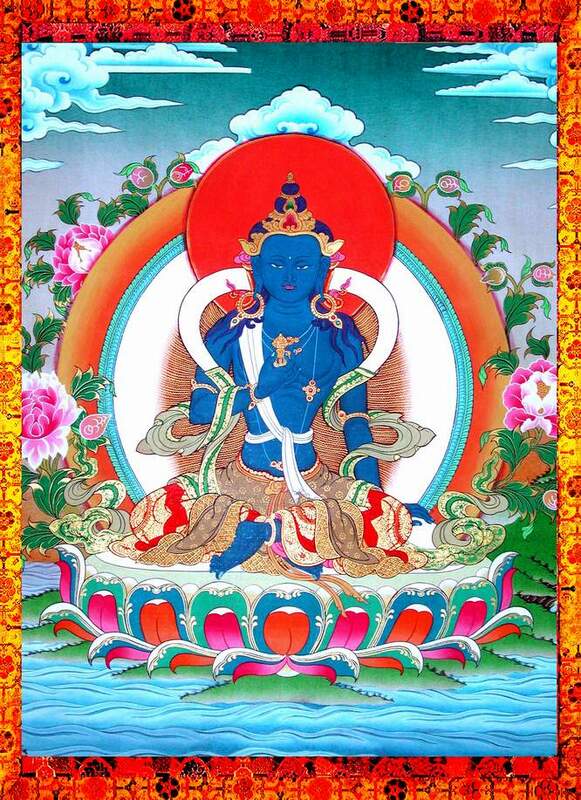 An image of Ksitigarbha Bodhisattva is also a very powerful enhancer for the powers of the Earth Seal. Furthermore, you need a lock coin pendant to help catch on the wealth luck. Windhorse or Lung-Ta with the ‘Wish Fulfilling Jewel of Enlightenment’ on its back. Please note that this is the Lung Ta or Wind Horse, just found out that some people try to sell of an ordinary image of an ordinary horse saying its a Lung Ta. From my personal collection. A rare Red Amber Ksitigarbha. If wearing it as a pendant, I prefer the image with the five leave crown. It is quite easy to deal with the Star of Yin House, all you have to do is engaged in Yang activities like go out and have fun, listen to uplifting music, play some mantras, or chant mantras, eat out with families and friends, be surrounded by naturally more yang animals like dogs and birds, be surrounded with flowers, and much to my friend and reader DU’s happiness wear gold. 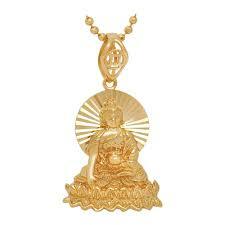 To add more yang wear gold in the image of the Buddhas, Bodhisattvas or Deities. 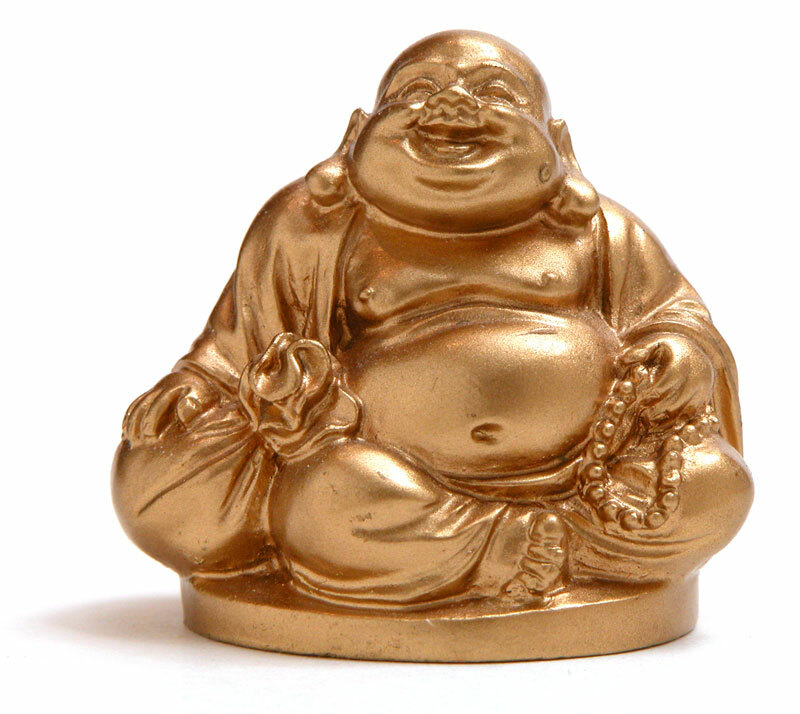 By the way, a Happy Buddha is also very Yang. This piece looks much better in person than in this picture but I know somebody who got this pendant. The person was having a hard time deciding, but for some reason when this picture was taken there seem to appear an aura like image. 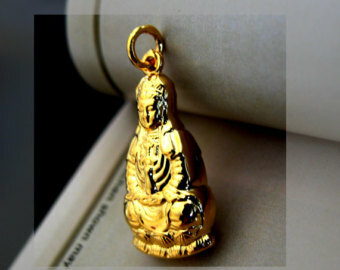 Also, this particular Maitreya Buddha pendant or Happy Buddha pendant is quite different because if you look at its face it has a happy but calm or serene face. By the way, I’m sure there is a valid scientific explanation for the appearance of the aura, but for it to happened at the time when the person is deciding to get it or not, is something that can’t be easily explained. In my previous post, I talked about the forecast for the 2015 Year of the Wood Sheep, mainly focusing on the Bazi or Paht Chee with the annual Flying Stars and 24 Mountain Stars. There I talked about the Holy Trinity of Protection for the year, which are the images of Kuan Yin, Kuan Kong and a Kalachakra. In all my forecast I start with the East, but I’d like to change that a little this time. Let’s start with the center because this is quite important. 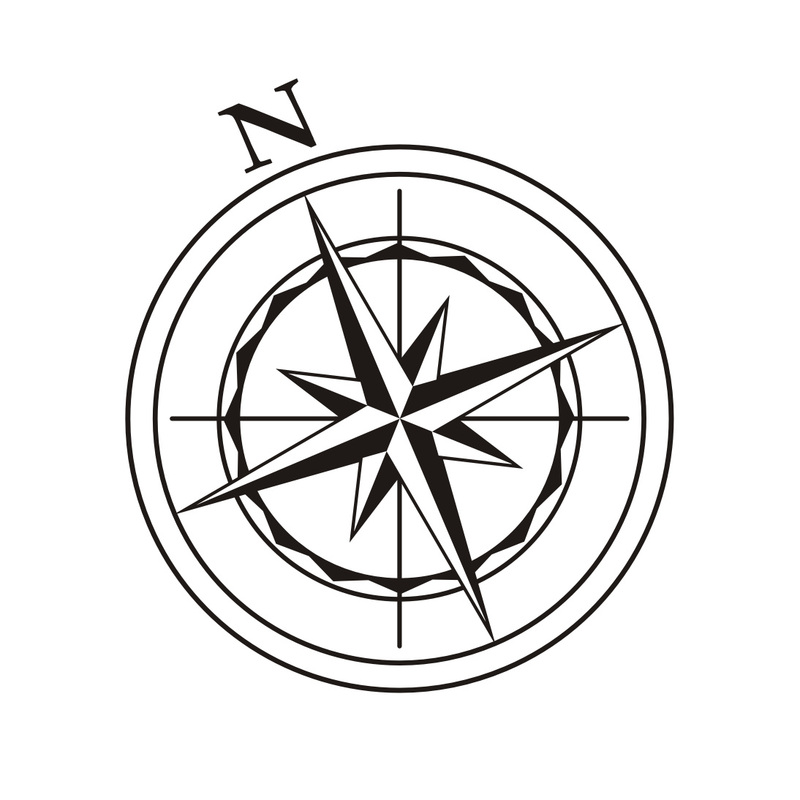 The Center has the #3 Flying Star, which is also, called the ARGUMENTATIVE STAR, because of this, the year is then ruled by this particular star. The 3# Flying Star’s element is also wood, and as we know, if coupled with the Bazi reading of the year which is largely ruled by the Wood element it thus then make the ruling star a very strong one. Its natural strength is enhanced and doubled. Effects: The Flying Star #3 also known, as the Argumentative Star is a star that causes relationship problem, numerous bickering, litigation problems, quarrels and problems/conflicts with people in authority. This year it will greatly affect all of us. And it is further doubled if your office or room is in the center of the house, building, establishment, etc. Furthermore, as mentioned in the earlier post, there’s a destructive pillar in this year’s Paht Chee chart, namely the word element destroying the earth element this further strengthens the quarrelsome nature of the star. If not controlled and suppressed, this star will bring about tremendous with your family and officemates or business partners. It can also cause a lot of unnecessary legal issues. This star has to be suppressed. It also has to be noted for this year, that all of us are affected by this star, but the most affected are the animal signs whose intrinsic element is earth and people whose self – element is earth are the most affected. Feng Shui Cure: Normally the best cures for this star are either the Ksitigarbha Fireball or the Nine – Ring Sword of Kuan Kong. The image of Kuan Kong is also a very good cure for this star. People affected by this star can wear or carry an image of the cures. 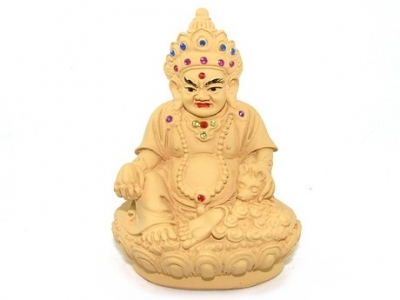 The Maitreya Buddha also known as the Happy Fat Buddha is also a great help. These are what I normally recommend. However, for this year, as mentioned in my previous post, we will all need the Holy Trinity of Protection for 2015 Year of the Wood Sheep. The said Holy Trinity of Protection are Kuan Kong, which will suppressed the said star, Kalachakra for the peripheral effect, and Kuan Yin with Heart Sutra (you can carry the Heart Sutra separately) to create harmony. It is not enough for us to simply suppress and protect ourselves from the effects of the said star, we must actively create harmony. Inviting the said images in your home, and wearing their images as a pendant will protect us from the terrible effects of the said #3 Argumentative Flying Star. For those who have the Wish Fulfilling and Buddha’s Blessing Mantra Pendant, all you need is to get an image of Kuan Yin and a Heart Sutra that you can carry around. 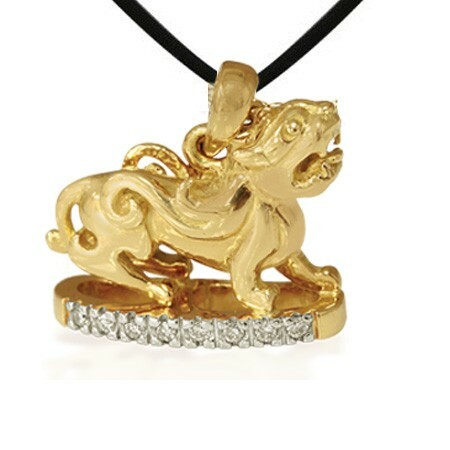 In wearing a Kuan Kong pendant remember to look for one that has a fierce face and better to get them in gold or something that has a red face. If you wish to wear or invite ‘non – religious’ images for this star, you can use the Ksitigarbha Fireball or Nine – Ringed Sword with apple, and Kalachakra. Kalachakra is a religious image but it doesn’t bear the image of a Buddha or Bodhisattva. 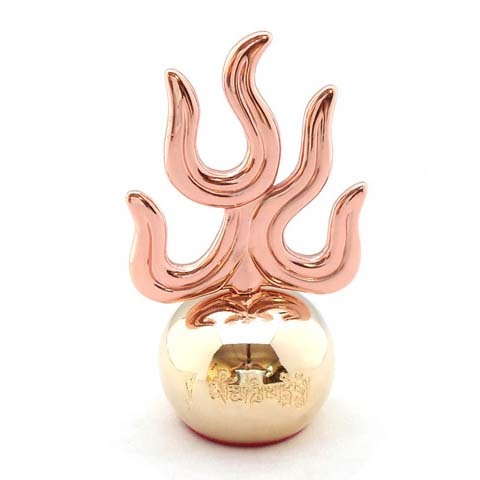 The Ksitigarbha Fireball is a pearl on the hand of Ksitigarbha Buddha that fires up when there are negative energies. The Nine Ring Sword is the sword carried by Kuan Kong. However, I think what is more important to know here is that depending on the location of the seat power, some countries might experience more political instability because of fighting. Some countries might even brew a possibility of war. Middle East countries are definitely affected with this star and the China might also be affected, although knowing China, it is highly possible that this is going to be because of their own doing. South East Asia is technically not very much affected of this star, but since this is the ruling star and because of their proximity to China, this might affect them. For the Philippines, base on the chart, our sea dispute with China might further escalate. We can only hope that the peaceful Tai Suey and ruling sign of the year will be enough to temper the effects of this star. Leaders who are calm are needed now. Effects: This star brings luck to your endeavors. It helps ensure your success. This year the White Victory Star also ensures that people whose main door faces the east will have wondrous victory luck. Feng Shui Enhancers: Put in your bedroom or carry or wear one of the following images – Victory Banner, Lung – Ta or Wind Horse, Kuan Kong. Effects: As the name implies, this star causes illness and to some extent it can be fatal or terminal. Sometime, this star can also cause some accidents that may make you invalid for a long time if not permanently. However, while it will still affect the eldest daughter of the family, this year it is a weak star. 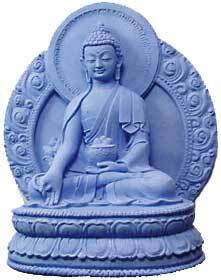 Feng Shui Cure: The primary cure for the ILLNESS STAR is the Medicine Buddha. Wear an image of the Medicine Buddha as pendant or wear the symbolic script of the mantra of the Medicine Buddha or wear a Medicine Buddha prayer wheel to help counter the ill effects of the said star. Chanting the mantra of the Medicine Buddha is also a great way to manage the said star. Secondary cure is Wulou (also spelled as Wu Lou) or Holy Gourd. Please note that it is considered very disrespectful if you put an image of the Medicine Buddha in your room, so in this case one can put the Holy Gourd. Effects: The star brings hostility and loss through robbery, theft, or even manipulation. Feng Shui Cure: One of the following items – Image of Sun Wukong (aka Monkey God), Image of Kuan Kong (also known as Kuan Ti, Guan Ti, Kuan Te Ya, Guan Te Ya, Guan Gong), Image Elephant with Rhinoceros. 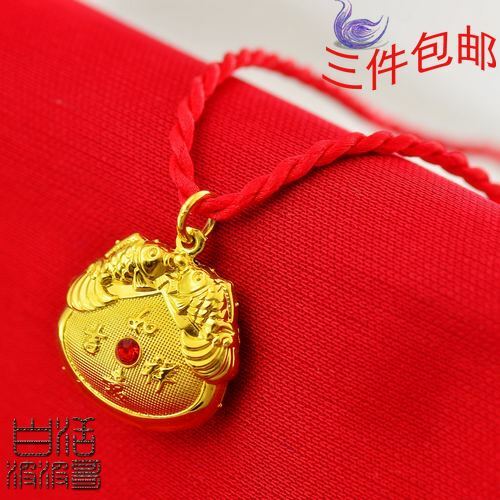 For people who are staying on this side have the house or office, or for people born under the sign of the horse, it is advisable to wear an image of Sun Wukong, Kuan Kong, or a Mantra Pendant. 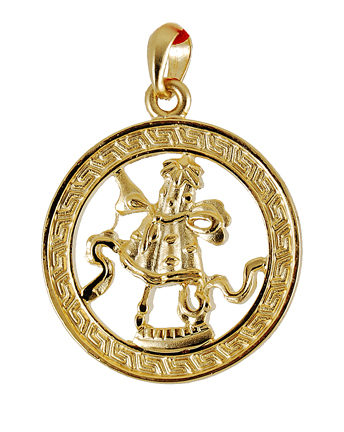 The WEALTH AND MASTER PROTECTION PENDANT that has the image of THE GREAT SAGE, EQUAL OF HEAVEN – SUN WUKONG, and the WISH FULFILLING AND BUDDHA’S BLESSING MANTRA PENDANT that has the image of Kuan Kong are also advisable. Sun Wukong aka Monkey God aka Pilgrim aka ‘Great Sage, Equal to Heaven’ is a very powerful wealth and protector god. He is one of the few deities worshipped both in Taoism (also spelled as Daoism) and Buddhism. Effects: Technically speaking, this is neither a good or bad star. The power of this star is to let you reap whatever you sow. This star basically multiplies whatever karma you accumulate. If you do more good things you’ll have more good luck in the future, but if you continue to do a lot of bad things, you multiply your negative karma as well. Feng Shui Cure: Last year, I didn’t put any enhancer or cure recommendations because I want people to be more conscious about what they do. However, a reader told me that there are times that we simply, without intending to be bad, create some things that earn us negative karma. For this I highly recommend either the image of the Medicine Buddha or the symbolic script of the mantra OM AH HUM or OM HANU PASHA BARA HE YE SOHA both of which are on the WISH FULFILLING AND BUDDHA’S BLESSING MANTRA PENDANT. However, it should be noted that this year, the Tai Suey God is also in the South. It has to be noted that Tai Suey is not part of the Flying Star but we need to always take this into consideration because offending the Tai Suey will create a lot of bad luck. The Taoists, where most of how we do Feng Shui originated, believes that a certain God called Tai Suey or Tai Sui or Grand Duke in English rules a year. 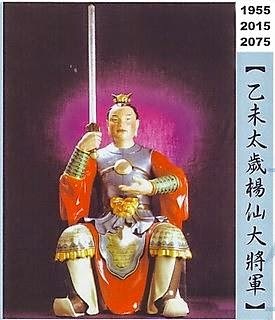 This year 2015, Tai Sui of the year is Great General Yang Xian. However, you have to understand a little about Taoist Gods for you to be able to understand why we have to be careful in dealing with the Tai Suey. Great General Yang Xian is the 2015 Tai Sui God. 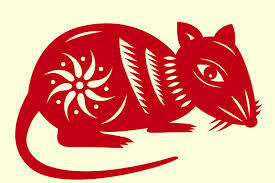 To help ensure that Tai Suey is happy with us always carry an image of the Pi Yao or Pi Xiu. This celestial animal will help appease the Grand Duke or Tai Suey. 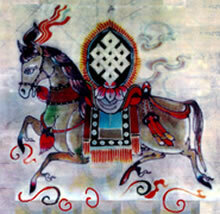 Another image that can help manage the Tai Suey God is to carry, display or wear an image of the Wind Horse or Lung Ta. People born in the year of the Sheep and Ox are directly affected by the Tai Suey God (also spelled as Tai Sui, Tai Sue) but those born under the sign of the horse, monkey, tiger and rat are also indirectly afflicted by way of side of afflictions. should have either the Piyao or Lung – Ta. Also, if your door faces SouthWest, or if your bedroom and office is in the SouthWest you should also put the image of the Piyao or Lung Ta or Windhorse. People who are occupying the SouthWest also should wear or carry the image of the Piyao or Lung Ta. 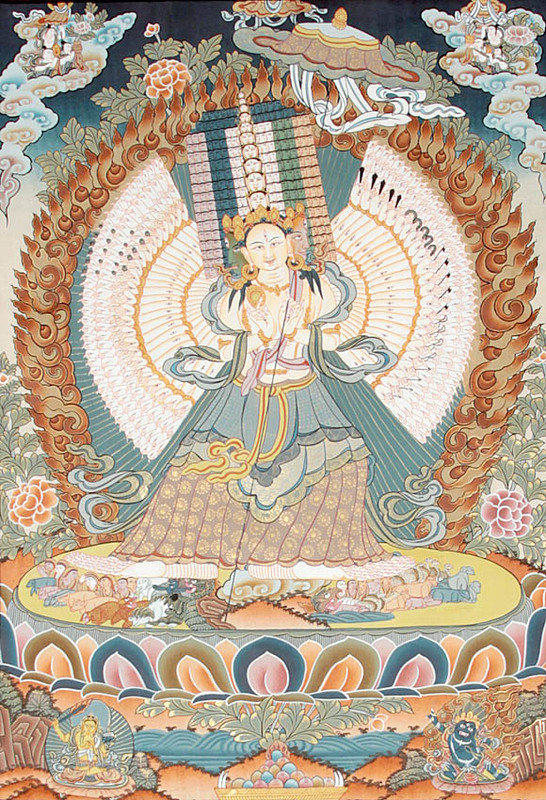 Also one of the best protections for the Tai Suey is an image of the Goddess of the North Star or Dou Mu Yuan Jun, thus having her image is also highly advisable. Effects: The 5 – Yellow Star is the worst of all negative stars! It’s the most dreaded star. It is said to bring 5 different kinds of misfortunes! Feng Shui Cure: AGAIN! AS MUCH AS POSSIBLE MOVE OUT FROM THIS SECTION OR DON’T USE THIS SECTION. You can also use the Five Element Pagoda (5 – Element Pagoda), or the Kalachakra. For people who stays in this section of the house or building and if you can’t move out of this sector, it is very important that you wear either the Kalachakra or the Five Element Pagoda. Furthermore, people born in the year of the Rooster should also ensure that they wear either the Five Element Pagoda or the Kalachakra. This year the Three Killings also found its way to the West, thus making a double whammy on this sector. Unlike the Tai Suey or the Five Yellow Star, which we must avoid, the 3 – Killings is something that we must confront. Meaning, the best way to deal with it is to face the Three Killings and not turn our back against it. If the 3 Killings is not confronted then it can wreak three kinds of misfortunes to a person. The three misfortunes are accident, financial loss, and illness. However, since it’s with the #5 Star confronting it might be bad for us. So a good way of dealing with the Three Killings is to place the image of the Three Celestial Guardians or images of three different Buddha, Bodhisattva, Deity or Immortal in the West section of the room, house, office, and building. Those who are staying in the West section of their house, office, building, or room must wear an image of the Three Celestial Guardians or images of three different Buddhas or Bodhisattvas or Deities or Immortals. 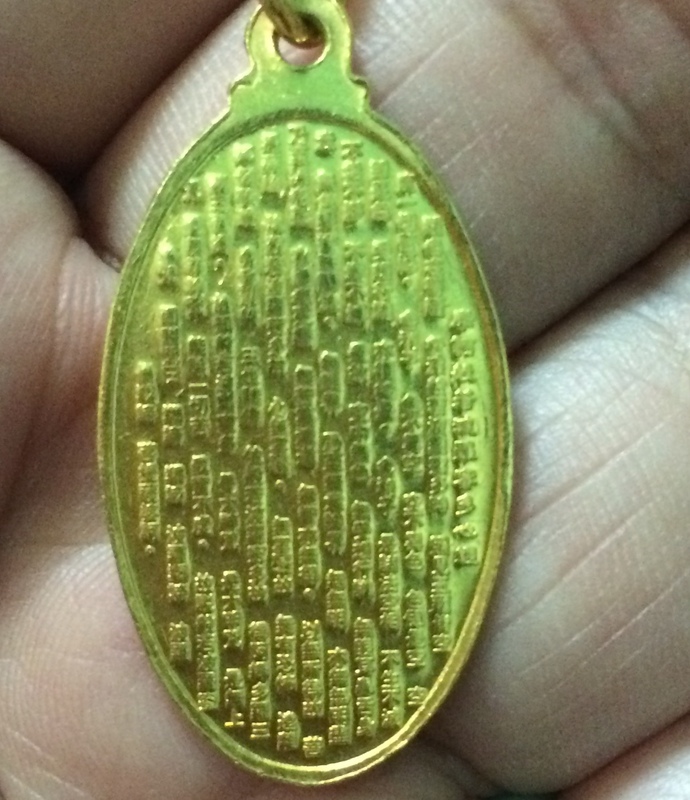 Front side of the WISH FULFILLING AND BUDDHA’S BLESSING MANTRA PENDANT. 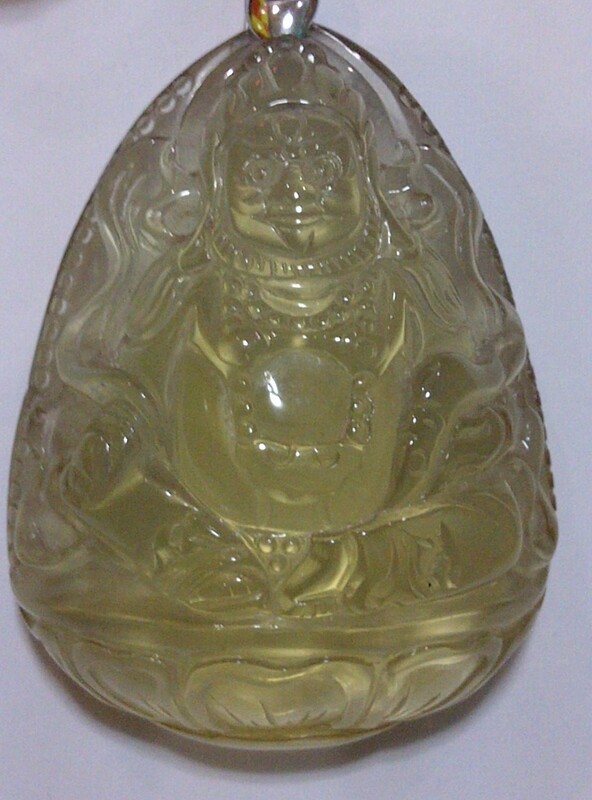 It has the image of the Kuan Kong, Medicine Buddha, and Yellow Dzambhala. Unfortunately, the pendant is temporarily not available until all the pendants has been served. Effects: Romance luck is heightened if your room is on this side of the house. For single people, you might have the possibility of finding love. For partnered people, you might find your love getting more ‘fragrant’. However, for married couple the effect might be two fold. First, you might find yourself loving each other more deeply, but there might also be the possibility of a third party getting involved. It is also called Scholastic Star because it also has a good effect on the scholastic pursuits of a person. Meaning, students may become more studious, and professionals might find that it’s easier to understand documents. 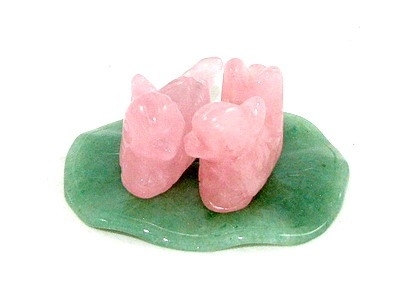 Feng Shui Enhancer: For single person you can put a Rose Quartz Mandarin Ducks on your bedside. For married couple, you can hang the Double Happiness on your headboard. To safeguard yourself from a third party, tie an Amethyst Geode with Red String on the foot of your bed or ask your partner to wear a gold image of Kuan Kong. You can also use the power of Green Tara to ensure that this star works for the positive only. 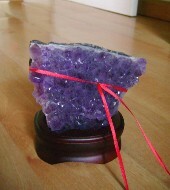 Amethyst Geode with Red String. Effects: This star is a very good star. It gives you abundance and to some a ‘bottomless’ pocket filled with money. This star is not just about money wealth but this is also for over – all abundance. People born under the sign of Rat, Ox, and Pig or Boar will benefit from this star. 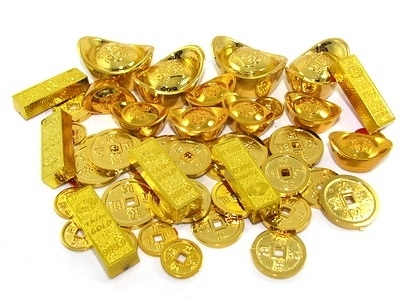 Feng Shui Enhancers: Faux gold Coins or Bars or Ingots should be place on this sector. 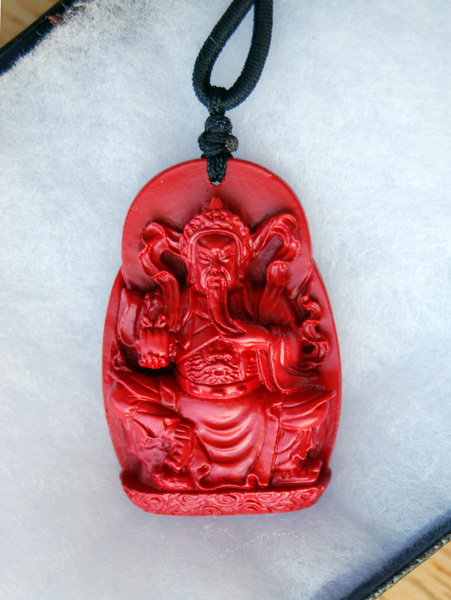 Wear an image of a Wealth Deity like the Maitreya Buddha, Kuan Kong, or Sun Wukong. Faux Gold Coins, Ingots, and Bars are available in Ongpin. Effects: This star helps set the ‘tone’ of the year for people whose office, or room is in the NE side of the house or building. Meaning, if you continuously do more good the more blessed you’re going to be. This also means that if you’re Chinese Animal Zodiac is not so good, you will have help from Heaven (Buddha, Bodhisattvas, Deities, Immortals, or Saints). This also means that you’ll be lucky enough to have people who will help you achieve your goal. Feng Shui Enhancers: In your room or office put some crystal ball or 6 White Jade tied with a red string. People who are staying in this sector and people born in the year of the Tiger and Ox will do well if they invite an image of a Buddha or Bodhisattva or Deity or Immortal by wearing their image as a pendant. I personally suggest one of the following: Kuan Kong, Avalokitesvara aka Kuan Yin, Maitreya Buddha aka Happy Fat Buddha, Shakyamuni Buddha, Medicine Buddha, Yellow Dzambhala, Green Tara. There are several different forms or manifestations of Dzambhala (also spelled as Jambala or Dzambala). 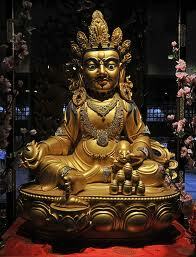 Dzambala is a Buddhism Wealth God. 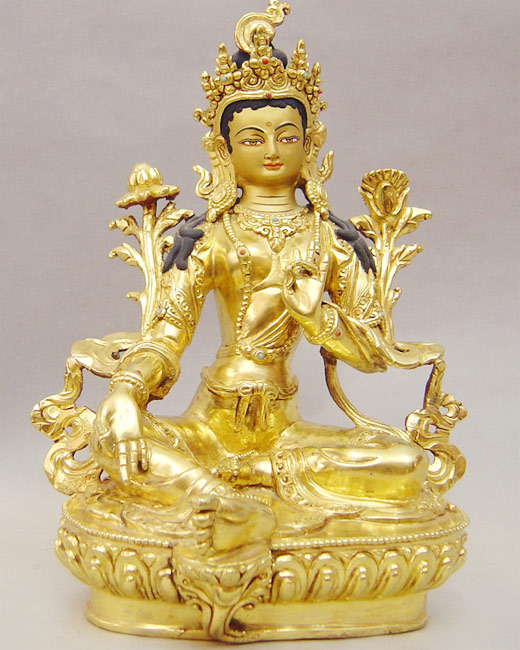 The one in the picture is the most common or most famous manifestation of Dzambhala which is the Yellow Dzambhala. Photo lifted from Google Images. 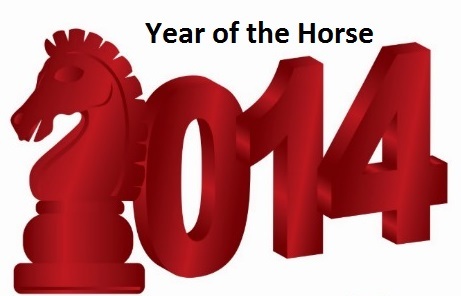 I have been receiving a lot of emails asking for the 2014 Feng Shui forecast base on the Chinese Astrology. 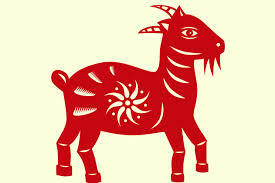 This year regardless of your Chinese zodiac or animal astrology success will be at hand. Some easier than others, but the common factor is you have to be aggressive. Work in humility but remember a silent worker is not somebody who will be recognized this year, thus complete success is not for them as well. Love luck is also strong for all animal sign. However, this may not necessarily be a good thing, because this could also mean that for some who are already in a relationship, might find themselves with a third party getting involve. For those who are single, while you might find yourself in a relationship, it may also mean that you may be a third party in a relationship. It can also mean that more people might go obsessed with another person. To enhance the good effects of this energy, one can wear an image of a pair of mandarin ducks, or the double happiness sign. For those who are in a relationship already, it will help to get yourself a Nine – Ring Sword (the sword carried by Kuan Kong), or an image of White Tara. This may be hard to find, so having the seed syllable TAM, which is the seed syllable of the all permutations of Goddess Tara will also help, another thing that may help is for you to get an image of a rooster with fan. Scholastic luck is also good for most animal signs. This means that in all endeavors, its better if it backed by research or solid data. This coupled with a strong instinct or gut feel are useful tools to ensure financial and career success. Also a lot of you have been emailing me complaining me about having the need to replace your Feng Shui cure every year. This is why I design the WISH FULFILLING AND BUDDHA’S BLESSING MANTRA PENDANT and the WEALTH AND MASTER PROTECTION PENDANT because I don’t want to have to replace or worry about what to wear every year. If you want to know more about it please just click here and here. Let us now go to the individual signs. This is going to be a busy year for you; you’re lucky to have the Flying Star #9 which is also known as the Multiplying and Future Prosperity Star. This would mean that all your good deeds will easily reaped good karma also. However, please remember bad deeds will also reap bad karma. You will also have good opportunities this year, however, you have to be vigilant and grab opportunity by the horn. Unfortunately, you also have the 3 Killings, but there’s no need to worry about this because simply being busy helps manage the Three Killings. You are also directly across the Tai Suey or the Grand Duke, which is the god of the year. This might create some problem. But no need to worry, simply wearing an image of the Pi Yao (also known or spelled Piyao, Pixiu, Pi Xiu) or the Lung – Ta or Wind Horse will help appease the Tai Suey. Using the 24 Mountains computation shows that you also have the Natural Disaster star so it is best to be careful especially in the evening. 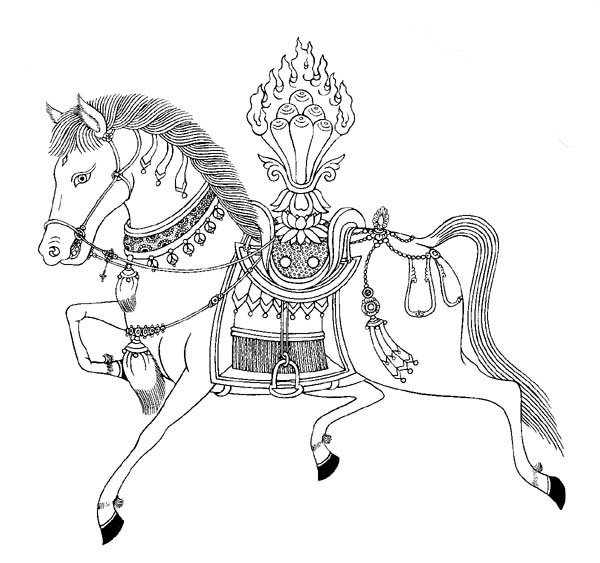 To manage or appease the Grand Duke or Tai Suey: Pi Yao (the 3 Celestial Guardians has the image of the Piyao so it should do already) or the Lung – Ta or Windhorse. 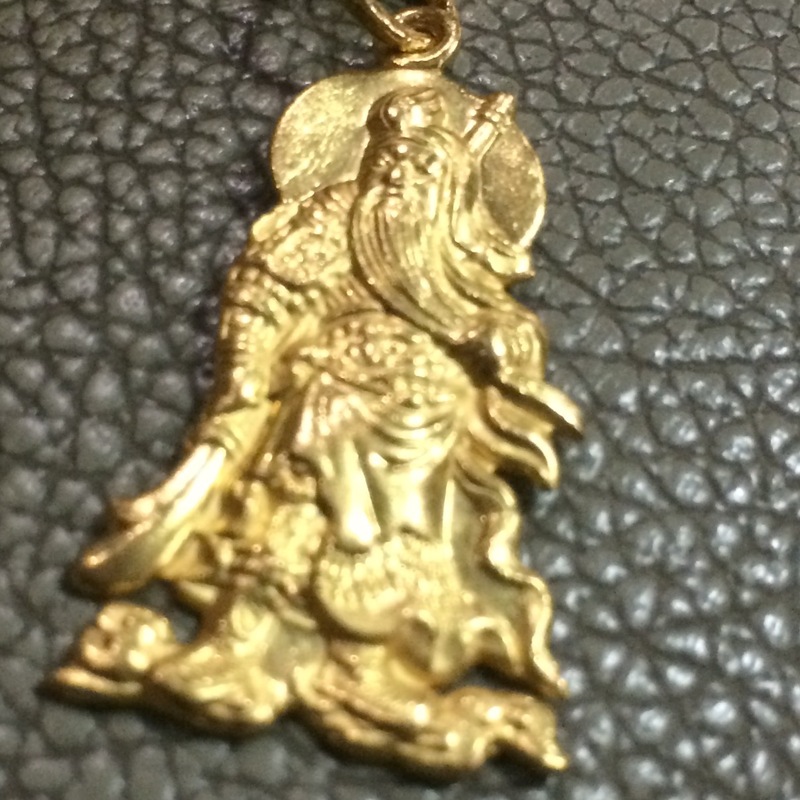 To manage the Natural Disaster Star: Kalachakra Pendant or an image of Kuan Kong (also spelled as Guan Gong). 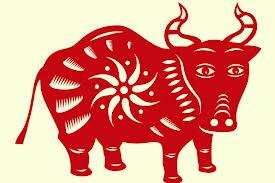 People born under the sign of the Ox are quite lucky this year. 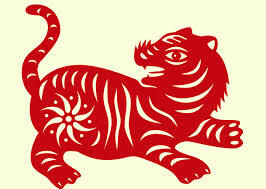 In fact, this is one of the luckiest Chinese Animal Zodiac of the year. I would like to say weirdly lucky, this is because if you look at the flying star that dominates you’re sector at the moment, you’ll see the #7 Flying Star which is the Violent Star. Initially speaking this should mean that this is a bad year for you, however, you’ll have to know that because of the year’s Bazi or Paht Chee combined with #2 Flying Star that goes to the East sector, which is also normally a bad star, creates Ho Tu 2/7 which creates some good luck for you. This means you will have great success luck. However, you have to be careful in going out in the evening and you have to be careful about people stealing your ideas and or backstabbing you. Wealth luck is generally very good to most Ox born people. But because of the Yearly Killings and the Yin House of the 24 Mountain Stars, you will have to be careful about getting into arguments and also as already mentioned about people backstabbing you and furthermore about theft. Furthermore, while money luck might come easy you have to watch out about how you spend them. 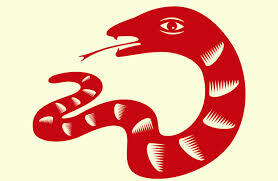 To enhance success luck wears an image of the Victory Banner or the Lung – Ta or Windhorse. To enhance wealth luck wears an image of the Gold Ingot or a Three Legged Toad or an image of Maitreya Buddha or an image of Yellow Dzambhala. To manage getting backstabbed a theft you can wear a Kalachakra Pendant or Kuan Kong with the Nine Ring Sword. Despite of the Double Yearly Conflict and Yin House brought about by the 24 Mountains Star, 2014 Year of the Wood Horse should bring you a lot of money or wealth luck. But like the Ox you should be careful of getting backstabbed and theft. Also do your best to keep a low profile. While there may be new beneficial relationships for you this year, you need to be careful that these relationships don’t get sour. However, you need to remember to watch out for your health, because you are afflicted with the illness star. On top of it, because of the Double Yearly Conflict and the Yin House, it’s best to avoid going to cemeteries, funerals, and/or hospitals. 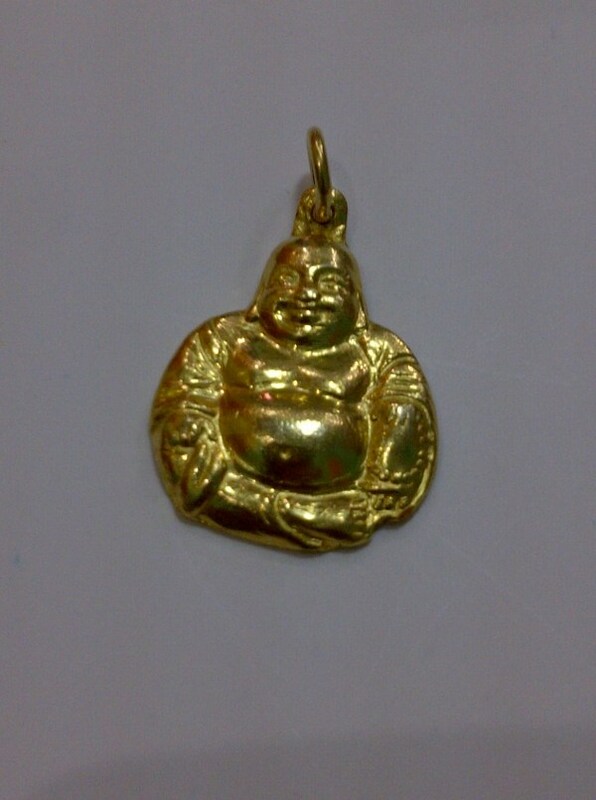 To further enhance your wealth luck you can carry or wear an image of the Maitreya Buddha aka Happy Fat Buddha or Sun Wukong or Kuan Kong or Yellow Dzambhala. To manage souring a beneficial relationship it’s best to carry either the Ksitigarbha Fireball or the Nine Ring Sword or an image of Kuan Kong. To manage your health wears an image of the Medicine Buddha or the symbolic script of the Mantra of the Medicine Buddha or the Holy Gourd. To manage the Double Yearly Conflict and the Yin House of the 24 Mountains Star wears an image of the Kalachakra. You have to be very careful about your health. If you can only do one Feng Shui enhancement or cure this year, then you’ll have to focus on your health because you have the illness star. You also have to be careful because the illness star can also bring in some accidents that might lead to long term or major health problems. But nevertheless, be happy that even if you have the Yearly Conflict of the 24 Mountains Star, you also have the Big Auspiciousness and the General Luck Star. This means as long as you manage your health, you’ll still see yourself achieving the things that you set out to do. On the side, you also have to watch out for getting into arguments. To manage the Illness Star or #2 Flying Star you have to wear an image of the Medicine Buddha or the symbolic script of the Mantra of the Medicine Buddha. If possible, chant one full male (108 times) a day the Mantra of the Medicine Buddha. It is also highly advisable to put on both sides of your bed a Metal Wulou or Holy Gourd. Also it will be nice if you can donate blood on the 2nd month of the lunar calendar and continuously involve yourself in charitable works. To enhance the Big Auspiciousness and General Luck Star you can wear an image of Kuan Kong and partner it the Victory Banner or Lung Ta. Kuan Kong will also manage and prevent you from getting into arguments. Dragon born people are by nature quite impatient and hotheaded, but don’t surprised if it becomes worst this year. The #3 Flying Star also known as the Argumentative Star, this is further strengthen by the Yi Duo of the 24 Mountain Star. So take care of your temper and always try to watch your words. Remember, if something can be amicably settled, then settle because if you go to court, chances are you’d be at the losing end. While money luck is good, personal success will need a little push, this is because of the combined influence of the Big Auspiciousness Star and the Yin House of the 24 Mountain Star. 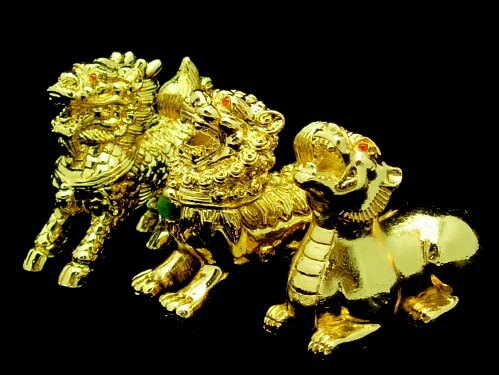 To manage the Argumentative Star and the Yi Duo, it’s best to wear as a pendant an image of Kuan Kong with the Nine Ring Sword. 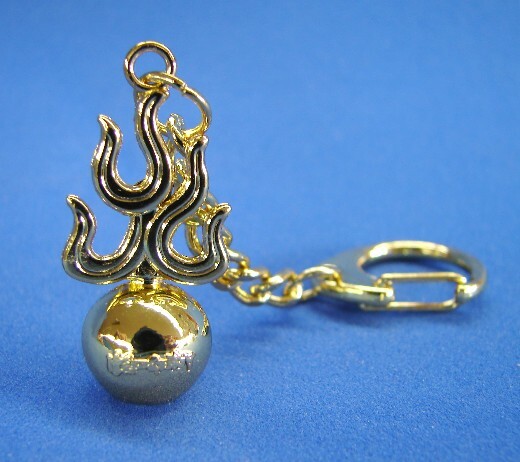 A Ksitigarbha Fireball will also be a powerful tool to fight the combine effect of the #3 Flying Star and the Yi Duo. Also, to enhance money luck wears an image of either the Maitreya Buddha also known as Happy Fat Buddha or Sun Wukong or Yellow Dzambhala. A White Dzambhala will be very good as well. 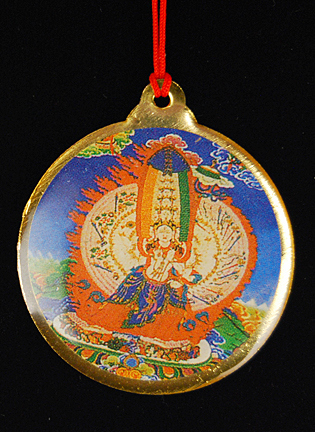 Lastly to manage the Yin House, you can either wear an image of Kuan Yin or wear a Kalachakra pendant. Ksitigarbha Fireball helps protect the bearer from the ‘argumentative’ star. Picture lifted from Google images. In choosing a Kuan Kong it’s important that you look at the face. The ‘braver’ the face the better. Also, I prefer dark colored stones or gold Kuan Kong, because Kuan Kong is basically a red face god. I veer away from the white jade variety. Photo lifted from Google images. While wealth luck for you is going to be good, you have to be careful and manage your temper. You might get into a lot of fight. There will also be a number of small obstacles that with perseverance can be managed. Nevertheless, you need to know that there will be a lot of people who will come along your way to help you succeed. This is due to the Heaven Seal of the 24 Mountain Star. However, you also need to watch out for your health, so make sure you don’t engage in any dangerous activities but at the same time make sure that you get some rest. Remember, success should be easy for you if you look pass the possible obstacles. You are also in side conflict with the Grand Duke or Tai Suey so take to mind to appease him by carrying or wearing an image of the Pi Yao and/or Lung – Ta which is also known as the Windhorse. 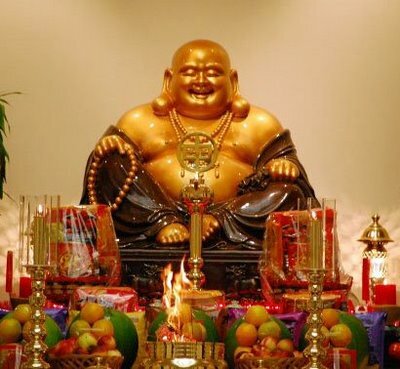 To enhance wealth luck you can wear either an image of the Yellow Dzambhala or Kuan Kong or Maitreya Buddha also known as the Happy Fat Buddha. To help manage the small obstacles it will be good to wear an image of Kuan Yin / Avalokitesvara or simply carry or wear a Lung – Ta. To help manage your possible health problems, carry a Wu Lou or wear an image of the Medicine Buddha. Humility is the key to your success this year. Remember that Tai Suey or Grand Duke resides on your sector this year, thus it is very important to always be humble, do good deeds to others and constantly appease him with either the Piyao or the Lung – Ta or Windhorse. You are also facing the 3 Killings and as I mentioned this is something that can be appease with the 3 Celestial Guardians or 3 different images of either a Buddha, Bodhisattva, Deity or Immortal. But do not despair, because you actually have one of the best Flying Star on your sector, the #8 Flying Star which is also know as the Wealth Star. This is somehow tempered by the fact that this is also year and as I mentioned your year is also your bad year. But this will manifest in terms of your drive. You somehow feel that you are drained off life’s energies. To appease Tai Suey carry or wear an image of the Piyao or Lung – Ta. It will be nice also if you can continuously engage yourself with charitable works. To manage the 3 Killings, as mentioned, you can carry an image of the Three Celestial Guardians or wear 3 different images of a Buddha, Bodhisattva, Deity or an Immortal. To enhance the #8 Flying Star you can wear an image of Kuan Yin, or Kuan Kong or Yellow Dzambhala or one of the three major Buddhas namely Amitabha Buddha, Shakyamuni Buddha, and Medicine Buddha. The Three Celestial Guardians are mystical celestial beings. This is a very good year for you. Aside from having the #1 Flying Star called White Victory Star you also blessed by the #8 Flying Star. You are one of the luckiest animal sign of the year. On top of that, you also have the Golden Deity of the 24 Mountain Star and while you’re afflicted with Yearly Conflict, it is very manageable. Love luck is going to be good for you this year, and wealth luck is simply astounding, not to mention that you can be very successful. 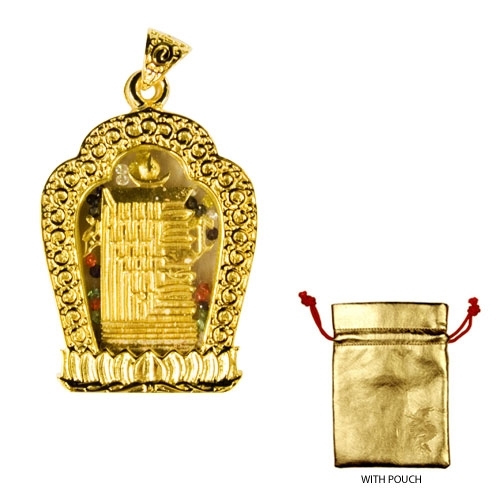 To enhance your luck, its recommended for you to wear an image of Kuan Kong or Maitreya Buddha or Sun Wukong preferably in gold as it will serve as an offering to the Golden Deity of the 24 Mountain Star. Furthermore, carrying the image or having the Victory Banner or Windhorse will also help ensure that your luck is further energized! This year the reading for people born in the year of the Monkey is not so straightforward as compared to the other Chinese Animal Zodiacs. Technically speaking you are quite lucky this year specially for those who have their own business and are involve in stocks. However, you are afflicted on both sides with Yearly Conflict or Affliction and this combined with the year’s Bazi or Paht Chee makes this year of the Wood Horse a little complicated. Although karma always has a role to play in our lives, it is rarely that a year’s forecast will be greatly affected by the previous year’s performance of the Monkey. I hope I’m writing this clearly because it is quite difficult to explain this. Technically speaking, the Monkey should have a great year aside from some petty obstacles brought about by the Yearly Conflict of the 24 Mountain Star formulas, which flanks the Monkey sector on both sides, which greatly affects your health and makes success quite difficult to achieve. However, you have very good wealth luck. So this means that personal success and career growth may be difficult to get but business luck is quite good. But here’s the thing. Your luck this year is highly influenced by the karma you sow last year. As mentioned everything that happens to us is either destined by fate, by Feng Shui, and by our immediate karma but it is quite rare that our immediate karma will greatly influence the luck for the year. 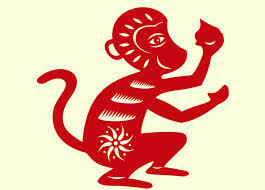 This year such is the case for people born under the sign of the Monkey. Needless to say, if you created bad things in 2013, in 2014 the year of the Wood Horse you’ll reap all those bad karma that you sow. The influence of your 2013 deeds to your 2014 life is really big. 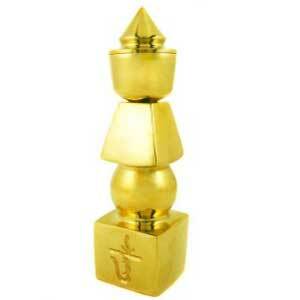 The good thing is that you have the Golden Deity of the 24 Mountain Star that will enhance good karma or lessen the impact of your bad karma. To enhance the #1 Flying Star it is recommended that you wear the Victory Banner or the Lung – Ta or Wind Horse. For your health carrying a Wu Lou or Holy Gourd or wearing a the image of the Medicine Buddha or the symbolic script of the Mantra of the Medicine Buddha as a pendant should be able to prevent or counter acting the bad illness chi. For those who are in business praying and carrying the images of the following Bodhisattva or Deities or Immortals should help. They are Sun Wukong, Kuan Kong, Maitreya Buddha or the Happy Fat Buddha. For those who are employed, again having the Victory Banner or the Lung – Ta should help. Also wearing the image of Kuan Kong should do a lot of help. 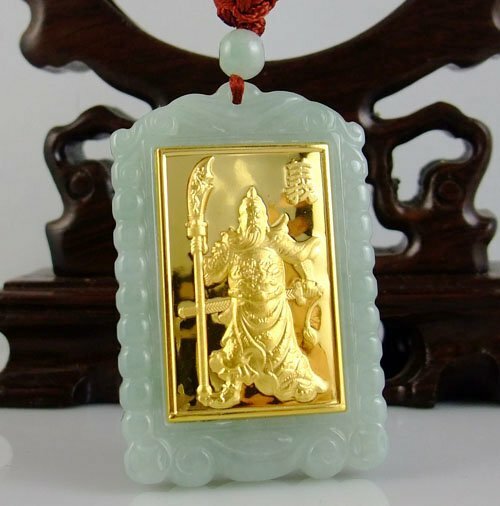 To manage your karma, you can wear a gold or jade pendant of the image of Kuan Yin the Bodhisattva of Compassion. Wearing the symbolic script of the Light Negative Karma Cleansing Mantra, OM AH HUM, and the Negative Karma Cleansing Mantra – OM HANU PASHA BHARA HE YE SOHA, should help ease some of the negative karma. While you have wealth and success luck, this might be greatly hampered by the fact that you may feel really weak or without energy. Furthermore, you have to watch out for possible controversy or reputation problems with your life. This is largely cause by the year’s Bazi or Paht Chee which is further strengthen by the 2 Yearly Conflict and Energy Reducer of the 24 Mountain Star. The good thing is the #6 Flying Star is on your sector also and this should give you some help from Buddhas or Bodhisattvas or Deities or Immortals. 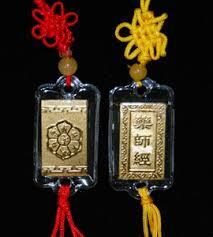 To enhance wealth luck wears the image of Yellow or White Dzambhala or Kuan Kong. 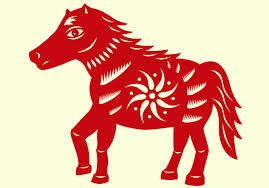 To enhance your success luck you need to enhance your Wind Horse luck by wearing an image of the Lung – Ta or Windhorse. Further strengthen this with the image of Kuan Kong (also spelled or known as Guan Gong, Kuan Ti, Guan Ti) or Victory Banner. To help deal with Yearly Conflict and Energy Reducer of the 24 Mountain Star you can wear a Kalachakra pendant or an image of Kuan Yin. It is always beneficial to wear an image of the Kuan Yin but for this year it’s good to also wear the The Heart of Prajna Paramita Sutra also called The Heart Sutra. I don’t want to be a pessimist, and I always believe that Feng Shui is so wonderful because it gives us the chance to remedy the problems brought about by the year’s Bazi or Flying Star or 24 Mountain Star. Sad to say, you might have a challenging year ahead of you. This is largely due to the 5 Yellow Star that runs into your sector. You and people born under the sign of the pig or boar who also have the Five Yellow Star will both have quite a tough year. For you the Yearly Conflict of the 24 Mountain Star further worsens this. The best thing is to keep a low profile. Be aggressive when it comes to work but keep a low profile. You must totally veer away from getting into risk whether personal or career wise. Don’t do anything that was not carefully studied. Your love and family luck is not very good as well. You might see a lot of arguments. If you’re not careful, you might have some money problems. For the Five Yellow Star it is highly suggested that you manage this by wearing a Kalachakra or a 5 – Element Pagoda. 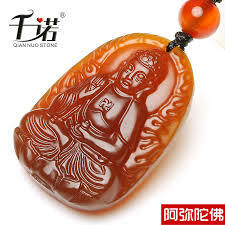 You can strengthen this by also wearing an image of Amitabha Buddha or Medicine Buddha. 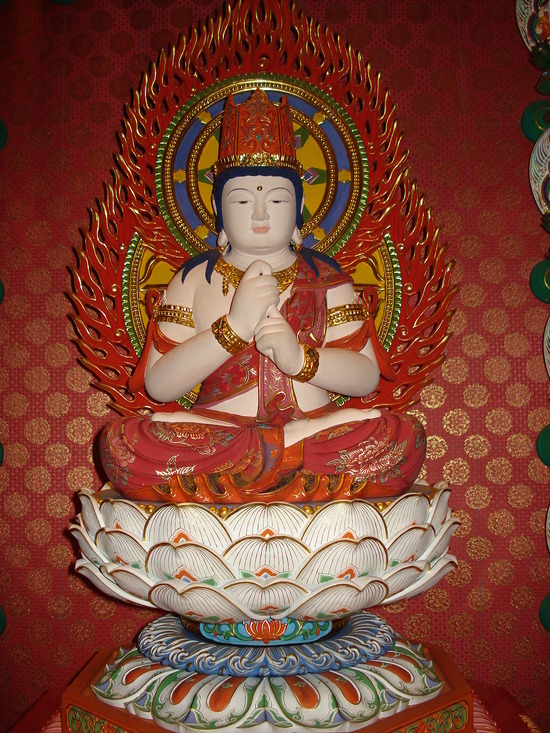 Having the image of Kuan Yin will also help. If you can do get a prayer wheel or wear a sutra. 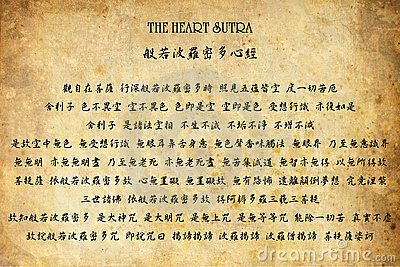 The Heart of Prajna Paramita Sutra better known as The Heart Sutra will be very good. 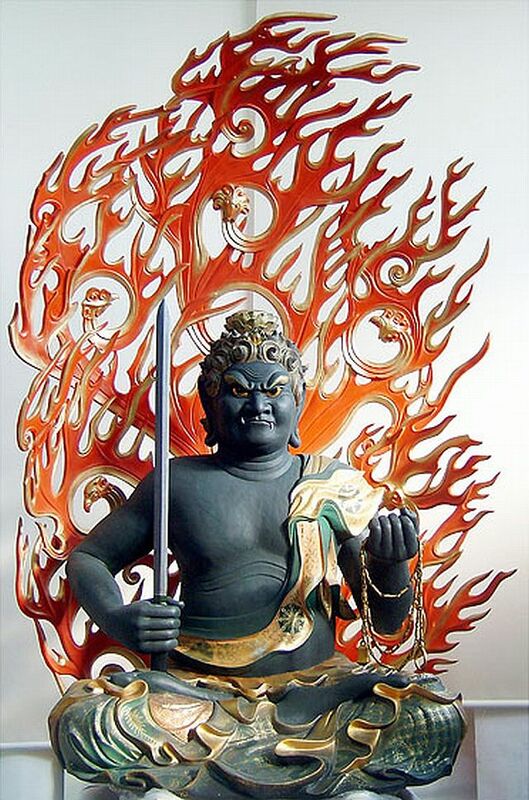 Carry an image of the Ksitigarbha Fireball or Kuan Kong’s Nine Ring Sword to help counter the argument energy. Further empower yourself with the Maitreya Buddha or Yellow Dzambhala (also spelled as Jambhala) and with the Wish Fulfilling Mantra. Energize your success luck with the Lung – Ta or Windhorse. Like people born under the sign of the Dog, you should also keep a low profile. This might be a challenging year for you. You further have to be careful about being robbed because of the Robbery Energy brought about by the 24 Mountain Star. Robbery here may mean actual robbery or people robbing you off your ideas or taking credits for the things that you did. Your love or family luck is going to be a little better than that of the Dog but it is still going to be chaotic still. An image of Kuan Kong or the Kalachakra will help counter the robbery energy brought about by the 24 Mountain Star. This is a miniature version of the Sutra of the Medicine Buddha and the Heart of Prajna Paramita Sutra which is a sutra closely associated with Kuan Yin. There are a lot of this kind of sutras that printed really small so one can carry it as an amulet. The HEART SUTRA which is also one of the Sutras of the Bodhisattva of Compassion is the shortest sutra in the world. This is the Chinese version of the sutra. Please note that the things mentioned in this forecast are base on a generic forecast of the individual animal signs. It is still better to look at your individual luck through your Bazi or Paht Chee. Also as mentioned in the beginning of this post, a lot of you are having problems because of having the need to wear so many things and having to check yearly what to wear. I used to have the same concern that’s why I decided to design for myself and for my family and friends a pendant called WISH FULFILLING AND BUDDHA’S BLESSING MANTRA PENDANT. 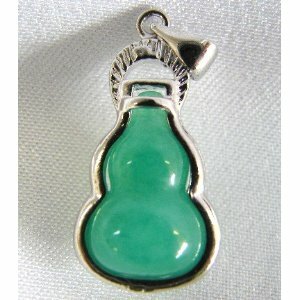 A lot of the cures or enhancers mentioned here are on the said pendant. 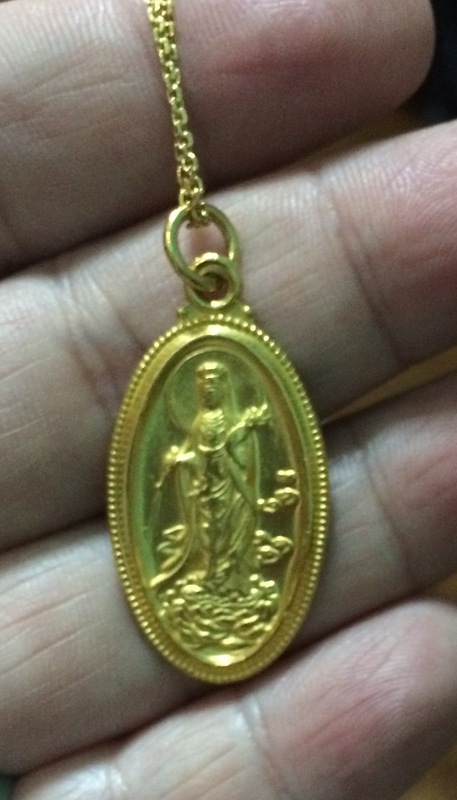 My only frustration is I was unable to include the image of Kuan Yin; this is because when I design the pendant, and each and every member of my family wears a Kuan Yin pendant. The WISH FULFILLING AND BUDDHA’S BLESSING MANTRA PENDANT is a pendant that you can wear regardless of the year because it has all the necessary cure and enhancers so there’s no need to replaced things. Even if you are not afflicted by a certain star, wearing it will simply continue help protect you. Kuan Yin or Avalokitesvara or Bodhisattva of Compassion, Medicine Buddha, Sun Wukong, Maitreya Buddha or Happy Fat Buddha, Kuan Kong, Yellow Dzambhala, Victory Banner, Three Legged Toad (Feng Shui Tips to Enhance Wealth Luck), Wish Fulfilling and Buddha’s Blessing Mantra Pendant, Wealth and Master Protection Pendant, Three Celestial Guardian. This is going to be a quick short post. 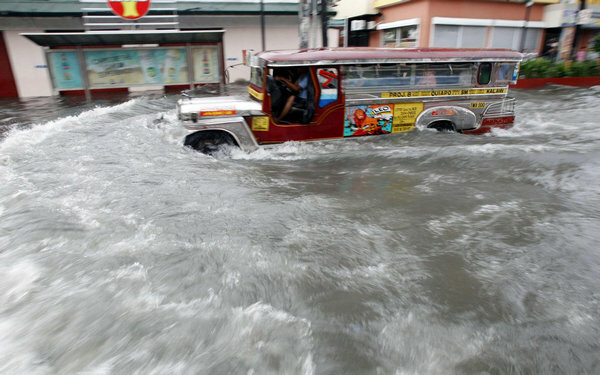 The Philippines, especially the National Capital Region and nearby provinces has been besieged by very strong incessant rains since last night. Several dams has overflowed and has started to released some water. 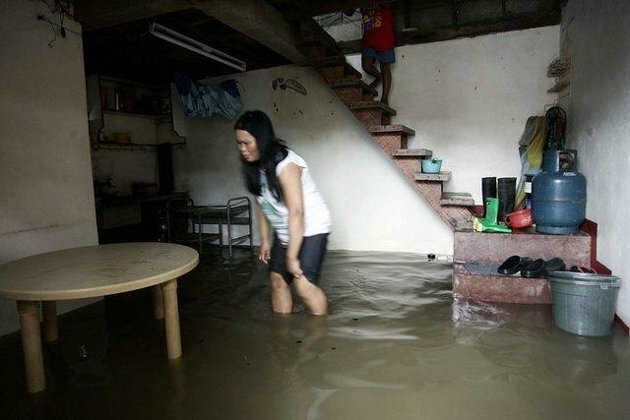 Several major streets of Metro Manila has been flooded, some the whole village are under water, like Talayan Village in, Quezon City. This is a weird occurrence because we don’t have storm signal nor there is typhoon within our the Philippine’s area of responsibility. The Philippines would need prayers. More than half of my readers are from abroad, and I would like to ask you to pray for the Philippines, especially the NCR. 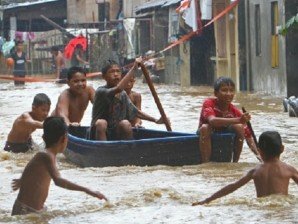 It doesn’t matter whether you’re Catholic, Protestant, Muslim, Buddhist, Hindu, whatever you’re religion is do pray for the Philippines, especially for the families who has been displaced because of the heavy rains and flood. 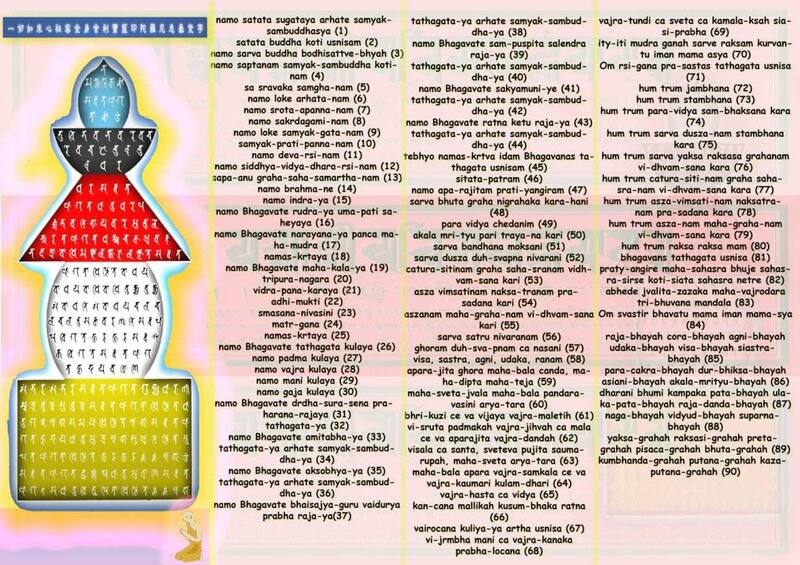 For Buddhist or people who believes in the power of mantra, please chant the mantras of the White Umbrella Goddess (full mantra) – TADYATHA OM ANALE ANALE KHASAME KHASAME BHAYRE BHAYRE SAUMA SAUME SARVA BUDDHA ADISHTANA ADISHTITE SOHA OM SARVA TATHAGATHA USHINISHA SITATAPUTRA HUM PHAT HUM MAMA HUM NI SOHA; the mantra of the Medicine Buddha – TADYATHA OM BEHKANDZYE BHEKANDZYE MAHA BHEKANDZYE BHEKANDZYE RADZA SAMUGATE SOHA; and the mantra of the Bodhisattva of Compassion, Kuan Yin – OM MANI PADME HUM. The said mantras are the standard mantras in time of natural calamities. I have previously written about the said Buddha and Bodhisattvas whose mantras are mentioned above. If you wish to know more about them please do read my previous posts about them. A few days ago, we talked about RECOGNIZING THE SIGNS OF DEPRESSION and briefly talked about how one should deal with it. On an earlier post called SUICIDE IS NOT A SOLUTION, I also briefly discussed on how one can deal with suicidal tendencies and depression using Feng Shui, Buddhism, and Taoism. Today, allow me to elaborate it a little on how can one use Feng Shui, Buddhism, and Taoism in dealing with depression. However, it should be noted that this is not an alternative or replacement, this is only a ‘supplement’ but if one is depressed one should always reach out to others and get professional help. That’s the most important thing one can do. Having said that, allow me to briefly share that Feng Shui, Buddhism, and Taoism ways to dealing with depression. Make sure that your room or house is well lit and please put about a tablespoon of rock salt or sea salt in all corners of the house or room. Make sure that when sleeping your head is not facing towards the window. Listen to positive, happy music. Chant a full mala (108 times) of the mantra of the BUDDHA OR BODHISATTVA OF COMPASSION, KUAN YIN, as many times as you can with a minimum of three times a day. You can also do this for a person who is depressed. Buying a CD that chants the mantra repetitively also helps. To know more about it, read my previous posts about Kuan Yin – KUAN YIN: THE ONE WHO HEARS THE CRIES OF THE WORLD; UNDERSTANDING MERCY AND COMPASSION: THE TRANSFORMATION OF AVALOKITESVARA TO KUAN YIN; and PAYING HOMAGE TO KUAN YIN, THE BUDDHA OF COMPASSION. 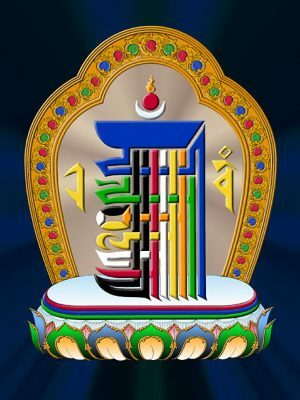 Another mantra that you can recite is that mantra of the MEDICINE BUDDHA –TADYATHA OM BHEKANDZYE BHEKANDZYE MAHA BHEKANDZYE BHEKANDZYE RADZA SAMUGATE SOHA. Again you can recite this for yourself or for a loved one. Constantly playing the mantra will also help. 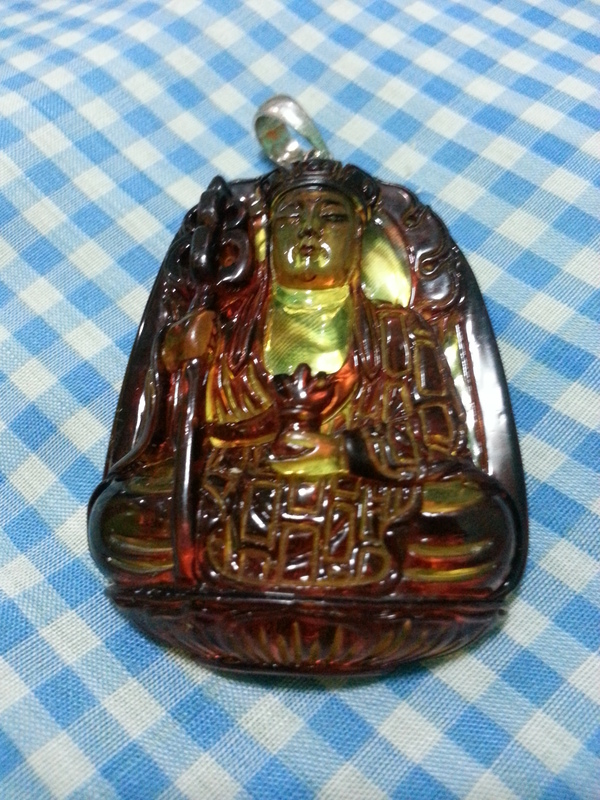 Wear a pendant with the image of KUAN YIN, MEDICINE BUDDHA, or SUN WUKONG. Take a bath in a tub with a cup of rock salt or sea salt. While in a tub you can also light some red or white candles and try to put flowers in your surrounding. Offer some fruits and flowers to THE GREAT SAGE, EQUAL OF HEAVEN SUN WUKONG, as mentioned in my previous post, SUN WUKONG exist both in Chinese Buddhism and Taoism. SUN WUKONG, is a happy god and if you’re familiar with his life story, he always uplifts those who are with him. Wearing an image of SUN WUKONG also helps a lot! But remember these are just ‘supplements’ only. The best way to deal with depression is to reach out and get professional help. In my last post before I went on a blog rest I talked about a Feng Shui blunder caused by our excitement while we’re on a vacation or a leisure trip or tour. I shared with you the bad luck that my friends and I experienced because of our innocent trip to the Ming Tombs. I also shared the story of a former officemate who went to Egypt entered a pyramid and had a series of bad luck. 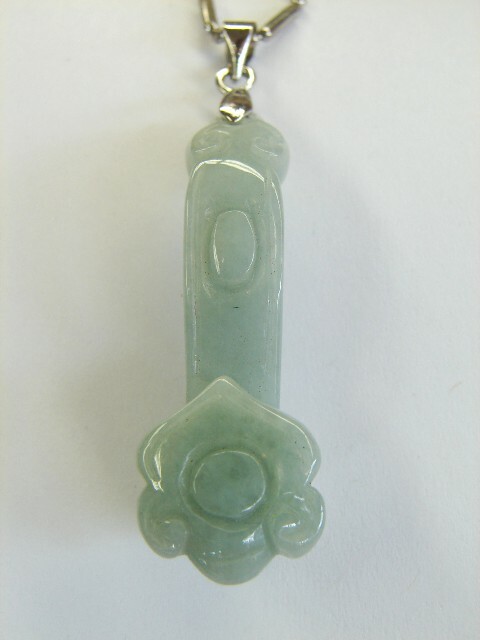 I received some email inquiring what are the Feng Shui, Buddhist and/or Taoist amulets that one need to protect oneself from the negative effects of a Yin dominant place like cemeteries, tombs, morgues. I debated whether to share those amulets here because as I mentioned at the end of the post, it is better not to tempt fate and just completely avoid these Yin dominant tourist spots. While I’ll most likely share the said amulets in a future post, because a hospital is also a Yin dominant place, I believe for now it is important that everyone understands that amulets may help but nobody can tell whether it would be enough so again – IT IS BETTER NOT TO TEMPT FATE AND JUST AVOID ENTERING YIN DOMINANT PLACES. You can just simply admire it from the outside. Having said that I would like to share with you how to cure should you accidentally enter a Yin dominant place while you’re on a trip. First thing you can do is to go a restaurant before you go back to your hotel. Ask for a rock or sea salt. Put some on your head and throw some on your back before you go back to your hotel. When you get back to your hotel, ask for a sea or rock salt and take a salt bath. A cup of salt in a bathtub will do. Just soak yourself for about 5 minutes. More if you want to relax, but 5 minutes is the minimum amount of time. If possible light some candle and place it beside you while you’re in the tub. Use red, yellow, orange, or pink candle. Don’t use white. Before going to sleep recite one full mala (108 times) of the Mantra of the Medicine Buddha – TADYATHA OM BHEKANDZYE BHEKANDZYE MAHA BHEKANDZYE BHEKANDZYE RADZA SAMUGATE SOHA. If you want to know more about the Medicine Buddha do read my post entitled – MEDICINE BUDDHA: A HEALER, PROVIDER, AND PROTECTOR OF BOTH THE PHYSICAL AND SPIRITUAL REALM. If possible, try to go out and have some small party with your tour group. Also, on the particular day that you made a Feng Shui blunder of entering a Yin dominant place, do sleep with the lights on that particular night. Receive Showers of Blessings by Tapping Two of the Most Powerful Mantras! A little over a month ago, I wrote about the power of mantras in a post entitled MANTRA: THE INSTRUMENT TO TAP THE POWER OF SYMBOLIC SCRIPT, SOUND, AND THOUGHT. In that particular post I discussed what is mantra and how it works. Today, I would like to share with you on how you can receive showers of blessings by tapping two of the most powerful mantras. I’ve mentioned about these mantras in that particular post but I want to talk about it again and share with you some stories about people who had benefitted from these mantras. The mantra I’m talking about are the WISH-GRANTING WHEEL MANTRA more popularly known as the WISH FULFILLING MANTRA – OM PADMO USHNISHA VIMALE HUM PHAT and the NEGATIVE KARMA CLEANSING MANTRA – OM HANU PHASHA (sometimes spelled as PASHA) BHARA HE YE SO HA. The Wish Fulfilling Mantra and the Negative Karma Cleansing Mantra are two of the most powerful mantras given to us by the Buddhas themselves. They are equally as powerful as the Mantra of the Buddha of Compassion, Kuan Yin or Avalokitesvara – OM MANI PADME HUM, or the Mantra of the Medicine Buddha – TADYATHA OM BHEKANDZYE BHEKANDZYE MAHA BHEKANDZYE BHEKANDZYE RADZA SAMUGATE SOHA. Let me discuss first the Negative Karma Cleansing Mantra OM HANU PASHA BHARA HE YE SOHA. Sometimes, you’ll find that some of the things that we long for are always ‘within reach’ but some thing will always happen that will prevent us from getting it. For example, wealth loss through a business project gone bad, or career advancement with higher pay that went to somebody else, or wealth that was swindled away from us, etc. The truth is sometimes this is cause by our negative karma who may be blocking some of the positive chi. Reciting the Negative Karma Cleansing Mantra will help unblock these blockages and make us more open to receiving luck or blessings. A friend’s father has been working really hard for the biggest project of his career life. By closing the said deal would be akin to winning the lottery and after about a year, he did close the deal and a few more months after he got the money, but after about 2 weeks he had a stroke! The prognosis of the doctor is really bad and they were told that his father would not be able to walk or move on his own again. Clearly, he won’t be able to enjoy the fruits of his hard work. My friend called me to ask me whether his father’s BAZI or Paht Chee analysis will be able to shed some light as to why this happened. I worked on his father’s BAZI and saw that he is in a particular stage of his life wherein he would have enjoyed financial wealth, however, it also indicated that he is at a critical stage of his life. The BAZI as I read it didn’t indicate death, neither did it indicate health problem; all I can discern with the analysis is that he is at this critical stage. Naturally, because of what he is going through, I would have to just assume that the ‘critical’ stage refers to his medical condition. This means also that it could only be because of a strong karmic influence. Whether past life or not I’m not sure. I explained this to my friend and he requested whether Feng Shui could do anything to help the condition of his father. I told him to use some Feng Shui cures but told him that since this may be karmic, it may be beyond ‘traditional’ Feng Shui, this should be inner or spiritual Feng Shui. His family is Catholic but out of desperation they were willing to try Spiritual Feng Shui. Told him to recite for his father one full mala of the MEDICINE BUDDHA MANTRA. He should do it aloud so his father can hear him and he should do this five times a day. But more than, I explained, since there is a strong indication that whatever happened to his father is karmic he should also recite the Negative Karma Cleansing Mantra five times a day. Preferably, he should do this after he has finished reciting the Medicine Buddha Mantra and like the Medicine Buddha Mantra he should recite the mantra loud enough for his father to hear him. After about 3 weeks of reciting the Medicine Buddha Mantra and the Negative Karma Cleansing Mantra his father started recovering from his stroke. A few more weeks after he was already strong enough to recite the mantras on his own. At present, his father is again almost back to his old self and in fact has been working again. To this day he continues to recite both mantras and although he didn’t convert to Buddhism he has invited the image of the Medicine Buddha into his home. The reason that it was also important for him to recite the Negative Karma Cleansing Mantra is because obviously his bad karma prevented him from enjoying a wealth luck that is clearly present as indicated by his BAZI analysis. 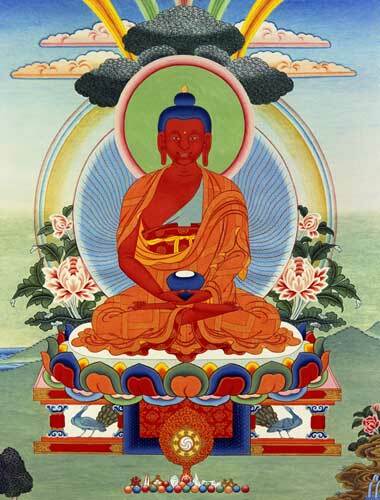 While reciting the Medicine Buddha Mantra will definitely aid him on his recovery, some of the Medicine Buddha’s blessing earned by the merit of the symbolic sound created by reciting his mantra, it may not be as quick because his own negative karma may block these blessings as it has blocked him from enjoying the wealth luck that he received. The other mantra mentioned earlier is the Wish-Granting Wheel Mantra or, as I said, more popularly called as the Wish Fulfilling Mantra. The Wish Fulfilling Mantra is a very powerful mantra, which grants us the blessing of receiving the things that we wish for. In fact, the mantra itself is so powerful that simply knowing it is already a blessing. A Singaporean friend whose cousin greatly benefitted from the Wish Fulfilling Mantra shared this story that I’m about to share with you. For the purpose of this blog, lets just call her M. M is a 28 years old, Singaporean Chinese, who works as a junior marketing officer of an international company in Singapore. She has been with her company for barely a year when their mother company in London had an opening for a higher position with international scope and naturally with a higher pay. M has always dreamed of migrating to US or UK, that’s precisely why she joined this particular company. However, she also knows that she is still considered as ‘neophyte’ in the said company, she’s just a Junior Marketing Officer, and Sing told her cousin that there’s a Senior Marketing Officer, then a Junior Marketing Manager, then a Senior Marketing Manager, then the Sales and Marketing Director. Apparently, the search for the new position in London is not just in Singapore but also in other countries where the company is present, and they are present in all South East Asian countries, the Asia Pacific region, and also in America, as well as some parts of Europe! The competition is tough! Furthermore, junior and senior marketing officers are not even considered for the position. M felt and knew that she doesn’t stand a chance and shared this with her mom who in turned shared this with a Tibetan Buddhist monk. The Tibetan Buddhist monk told M’s mom to let M try reciting the Wish Fulfilling Mantra. The instruction is for M to recite 7 full mala of the mantra for 3 days. On the fourth day she can try and send her application with her letter of intent. After which she is to recite 3 full mala for the mantra everyday. M felt that there’s nothing to lose in trying so she heeded the monk’s advice. To make the long story short M is now in London not for the position that was vacated but when they saw her application they saw another position that fits her. They weren’t really just looking for a ‘local’ to fill in the position but somehow they were impressed with M’s resume that the company for the first time in its history hired an Asian for the said position! Isn’t that wonderful? From a simple wish with zero possibility to a wish fulfilled! There are other stories that was shared to me or that I personally experienced about these 2 powerful mantras, but I suggest that the best testimonial would be your own experience. How does one tap into the blessings of these 2 powerful mantras? Why do they usually go together? The Wish Fulfilling Mantra always goes with the Negative Karma Cleansing Mantra because their effects may be complimentary. As shared with you earlier regarding my friend’s father, the Medicine Buddha mantra might not be as effective if his own negative karma is blocking the said blessing, in the same manner, while tapping into the power of the Wish Fulfilling Mantra it is better to make sure that we continuously cleanse ourselves by the negative karma that we accumulate by also tapping into the blessing of the Negative Karma Cleansing Mantra and we do this by reciting the mantra. I usually say 1 full mala of the Wish Fulfilling Mantra followed by another full mala of the Negative Karma Cleansing Mantra once a week. If I have a specific wish I recite them more than once a week. Furthermore, you can also say the Wish Fulfilling Mantra 7 times and blow on some incense. Once the incense is lighted, its smoke will bring blessing to other beings ‘touched’ by the smoke of the incense. Say the Wish Fulfilling Mantra 7 times and blow on your clothes it blesses you. If you put the symbolic script of the Wish Fulfilling Mantra and the Negative Karma Cleansing Mantra above doorways or your door will bless and cleanse all the people who passes underneath them. That’s how powerful these two mantras are. According to Lama Zopa Rinpoche, who perhaps the most famous Tibetan Buddhist monk next to the His Holiness The Dalai Lama and His Holiness the Karmapa, simply seeing the symbolic script of these 2 mantras will greatly benefit us even if you’re not conscious of it. To know more about symbolic scripts you can read my previous post called MANTRA: THE INSTRUMENT TO TAP THE POWER OF SYMBOLIC SCRIPT, SOUND, AND THOUGHT. Also according to Lama Zopa Rinpoche wearing the symbolic script of the WISH FULFILLING MANTRA and NEGATIVE KARMA CLEANSING MANTRA as a sacred jewelry will enable us to continuously tap into the blessings of the said mantras. This is precisely why I’ve decided and made sure that both mantras are included in the WISH FULFILLING AND BUDDHA’S BLESSING MANTRA PENDANT. I’ve just written about the WISH FULFILLING AND BUDDHA’S BLESSING MANTRA PENDANT yesterday and I’ve already received 7 requests from people from 4 countries who want to get the pendant for themselves. I’ve made this pendant more affordable by making it smaller. 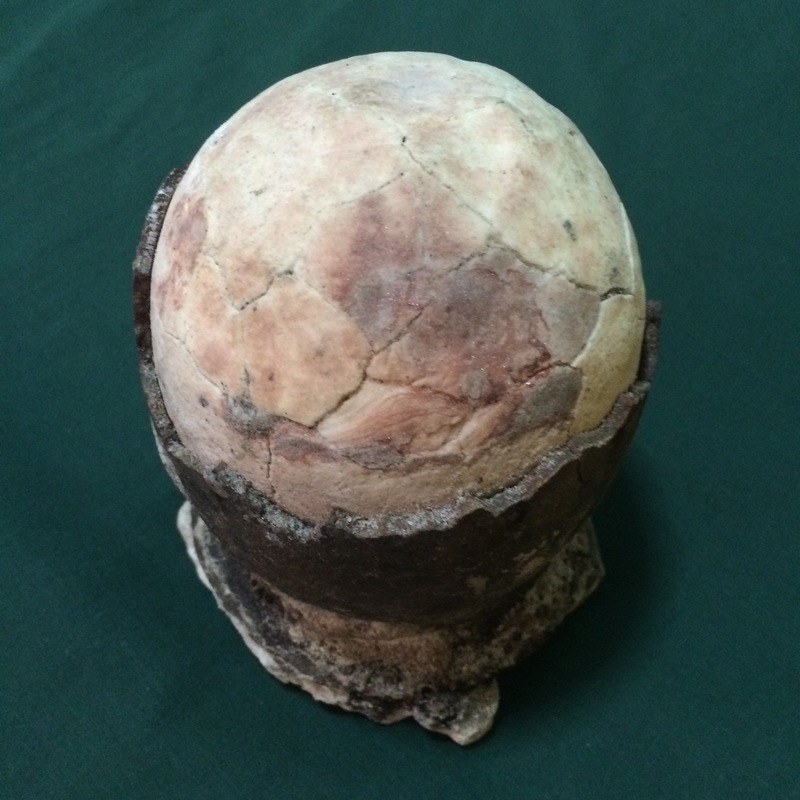 Its diameter is only about ¾ of an inch. Unfortunately, I’m not taking any ‘special orders’ right now because I’m still waiting for the WISH FULFILLING AND BUDDHA’S BLESSING MANTRA PENDANT of my family, relatives, and friends. Please understand that selling Feng Shui charms such as the WISH FULFILLING AND BUDDHA’S BLESSING MANTRA PENDANT and the WEALTH AND MASTER PROTECTION PENDANT are only incidental and is not a means of living. Nevertheless, please feel free to email me if you’re interested to get the pendant, no promises, but I’ll try to request my jeweler to make one for you after all the other orders has been served. You can also just copy the design and have your jeweler make one for you. If you want you can also get the Mantra Ring design by Lillian Too. It has the Wish Fulfilling Mantra and the Negative Karma Cleansing Mantra, but it does not have the Medicine Buddha Mantra, Seed Syllable of Green Tara – Tam (a short version of the mantra OM TARE TUTTARE TURE SOHA), image of Kuan Kong, Medicine Buddha, and Yellow Dzambhala. However, you can get them separately. 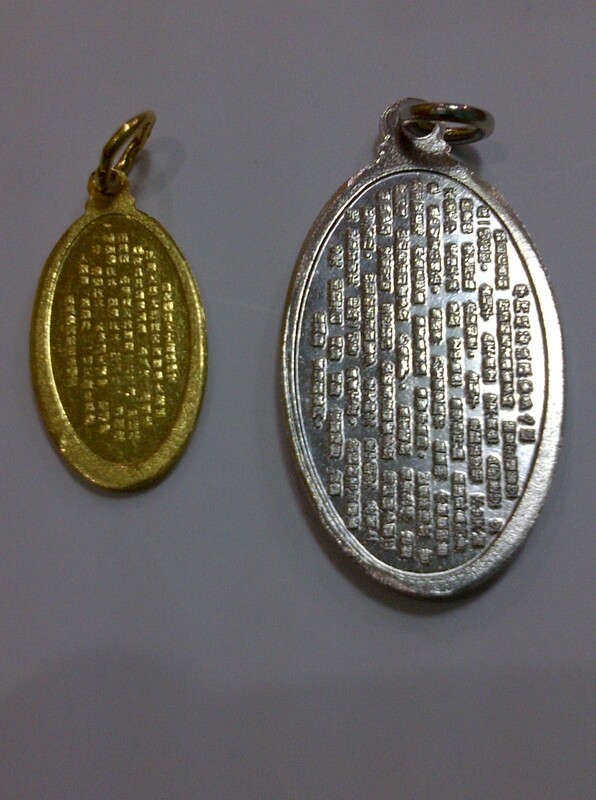 NOTE: I’m now able to serve request of readers to avail of the WISH FULFILLING AND BUDDHA’S BLESSING MANTRA PENDANT. 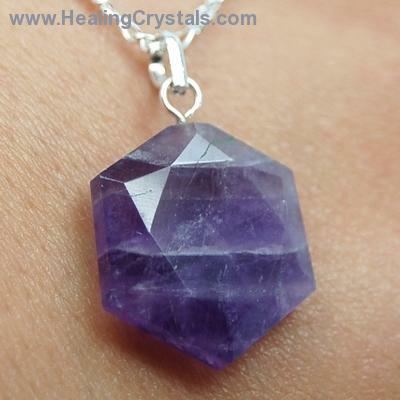 You can also read a reader’s personal testimony about the pendant by clicking here. She had her wish fulfilled right after she wore the pendant. This post was updated on Dec. 1, 2013.